This has been the year I finally embraced winter and truly started to enjoy it. 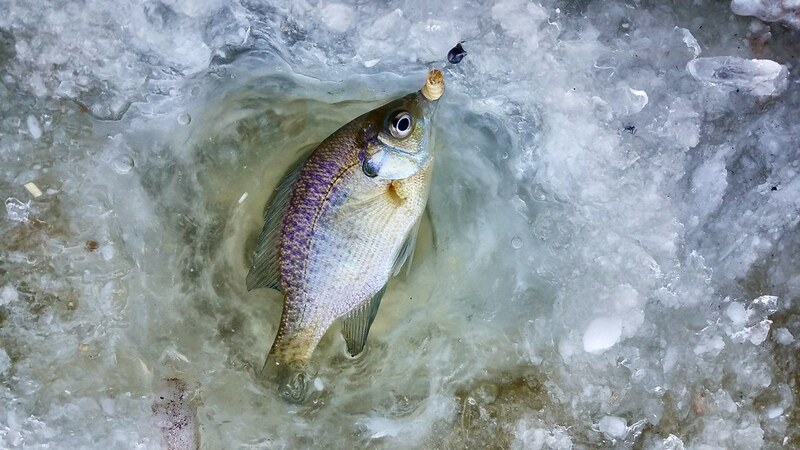 What changed my mindset was experiencing real ice fishing for the first time. Before this year, I had never actually walked on a frozen lake, much less heard the ice sing underneath me. 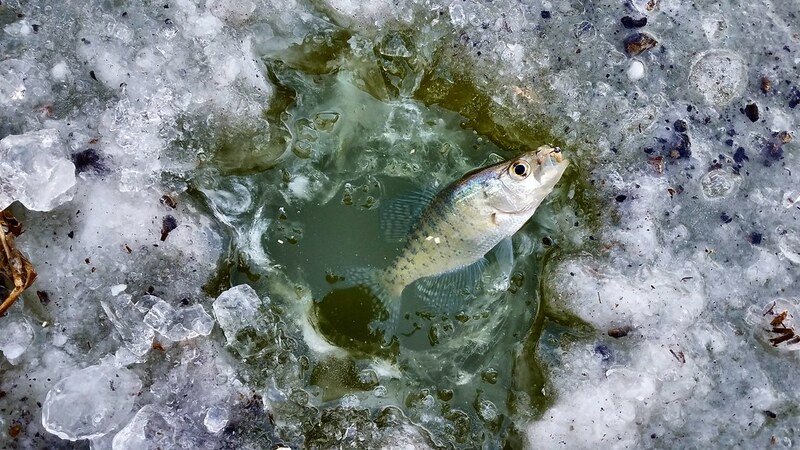 There is something deeply satisfying about having your feet planted on the ice and creating a small hole to see what fish are eager to bite beneath the surface. 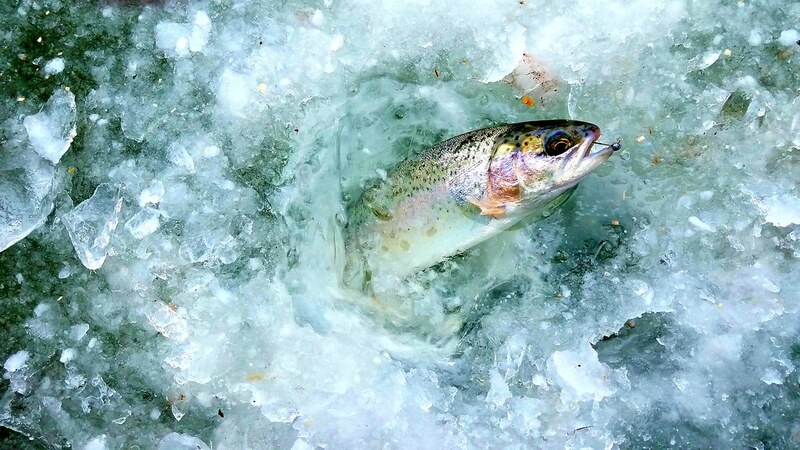 I think of ice fishing as a strange duality: mankind’s stubborn defiance of nature and complete unity with it. 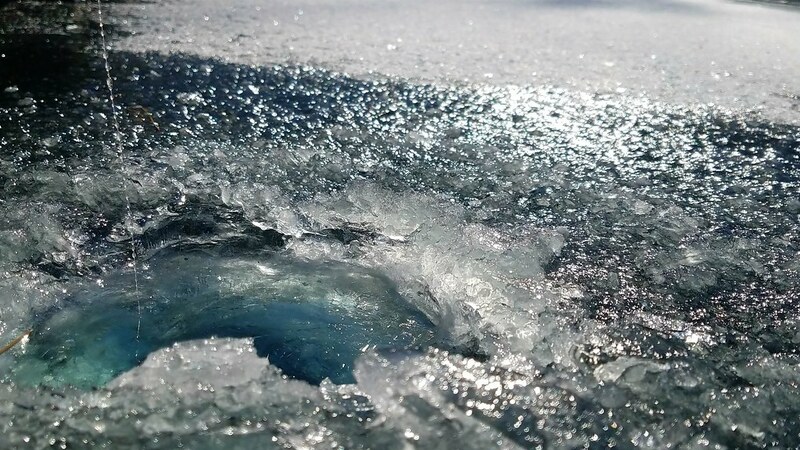 To some extent, one refuses to let nature take its course by creating holes through the ice (a clear sign from nature to keep out). Yet we do it anyway. We challenge the subfreezing temperatures for the chance to prove we can master the elements. 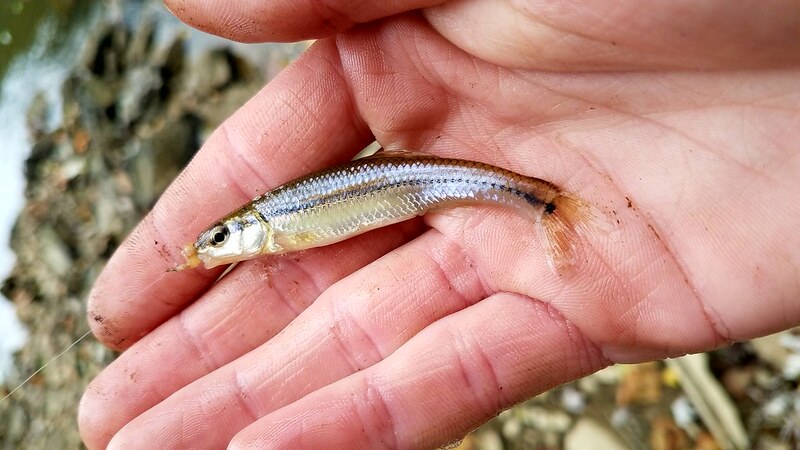 But at the same time, we have to be one with nature to know where the ice is safe, where to make a hole, what depths to find the fish at, and what baits to use. This duality is what makes ice fishing so addicting. Another part of winter I have trouble resisting is the beauty of the sound. Snow-topped ice has the intrinsic ability to muffle all sound, muting the mundane, white noise of the city. Leaving just the sound of geese flying above you and ice creaking below you, in these rare occasions you can break out each separate noise and find its source. First, a flock of Canadian Geese; shortly after, a much more precious and less commonly heard song, the song of the White-fronted Goose. It echoes through the air and then is quickly muffled by snow. The sound of calling geese is a welcome change from the normal noise of car horns and people. 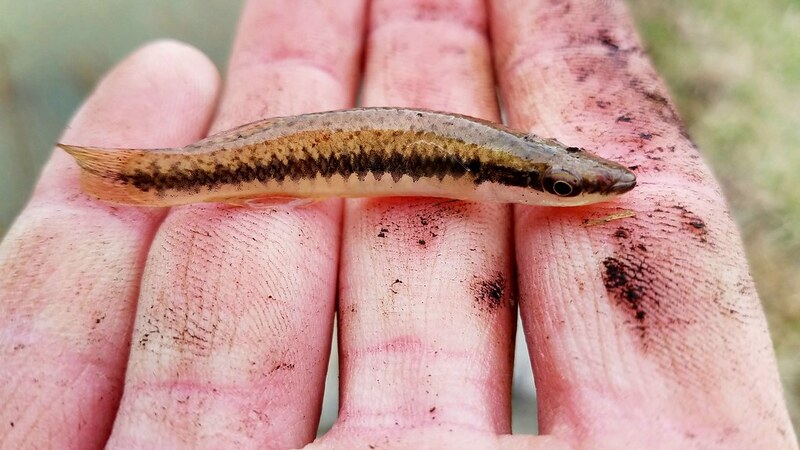 The slow-biting fish don’t seem like much of a challenge when you can lose yourself in the meditative sounds around you. With enough patience, a reward is bound to follow. 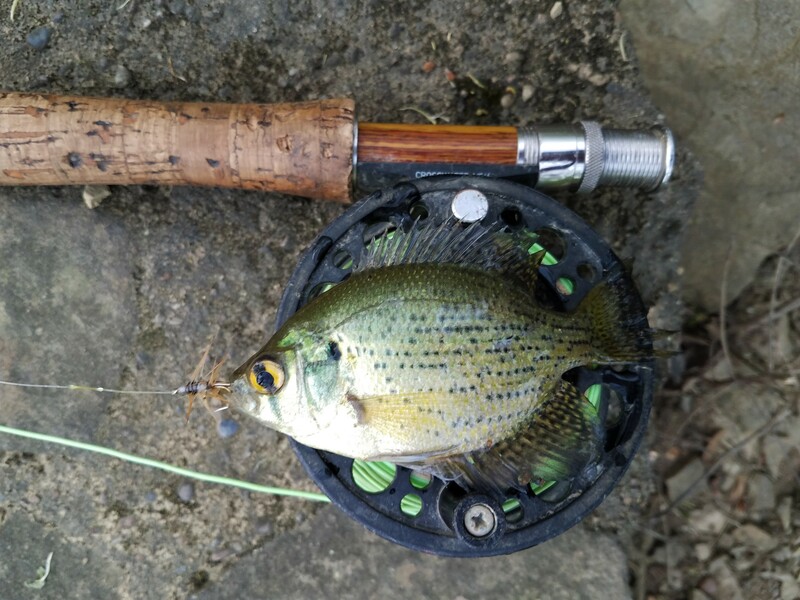 As the bird calls sound through the air, inevitably, the rod tip will bounce once. It’s usually a quick test bite to see if the offering is acceptable. Shortly after, a second tug on the line. This time, I’m ready and focused. The line twitches and the little ice rod is raised in the air, setting the hook. The fight begins. I have to keep the fish out of the structure I’m fishing, keep the line from nicking the edges of the hole, all the while keeping a very loose drag on light line. Fish fight in odd ways under the ice. Rather than making long runs like they do in summer, they tend to make quick, circular dashes. 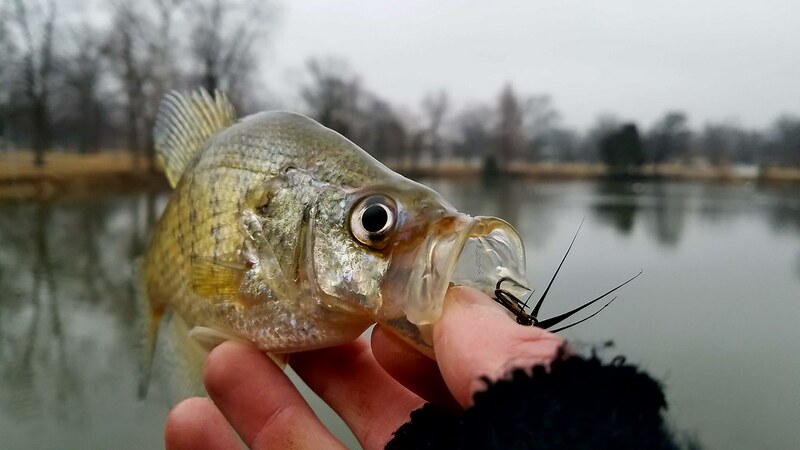 Occasionally, the larger fish will take a decent amount of drag, but more often than not, it is simply a matter of working the fish around in circles until it comes up through the hole in the ice. 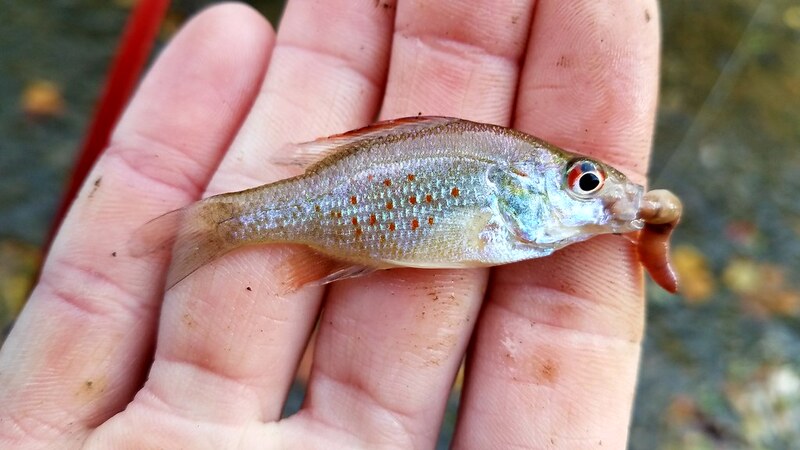 I swear the white snow makes each fish’s colors more vibrant. 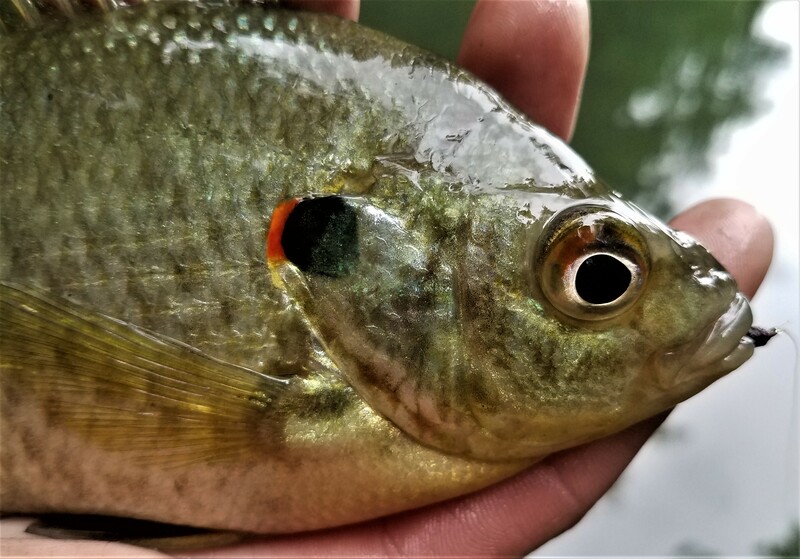 A simple Bluegill looks like a dramatic masterpiece against that amplifying background. 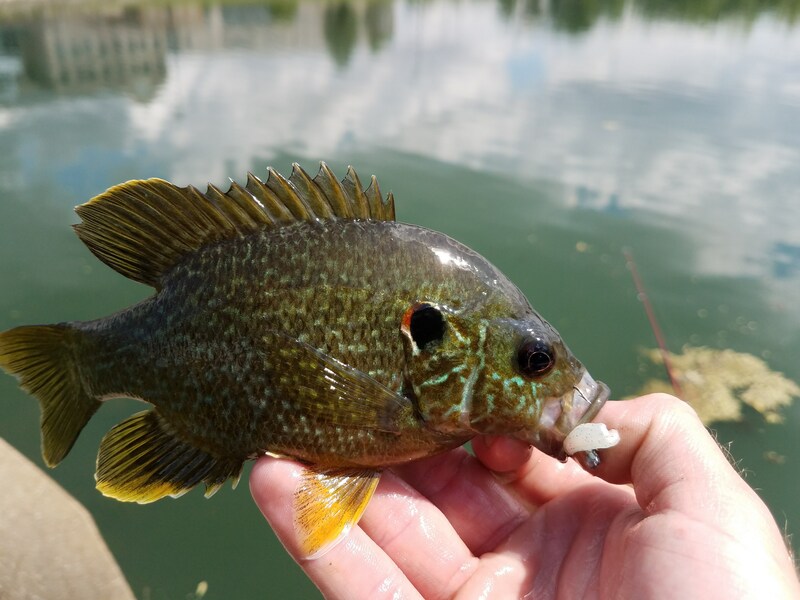 My favorite sight is when a Redear Sunfish finds my bait before a greedy Bluegill. 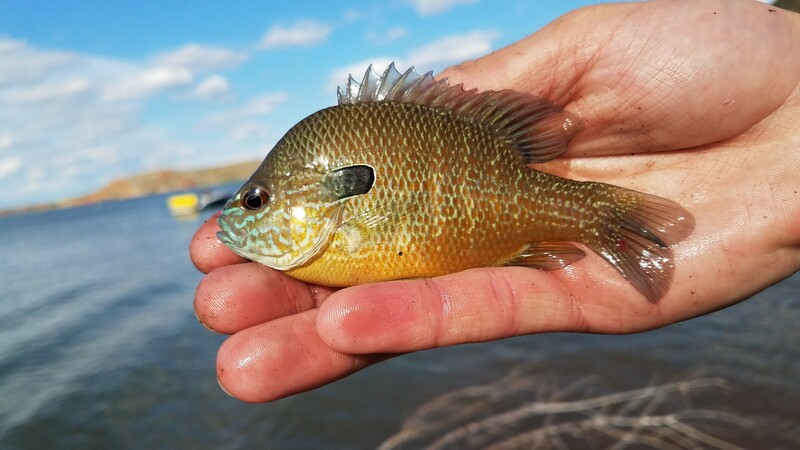 The lake I chose to ice fish here has notoriously low numbers of Redear Sunfish, so the competition is high and they haven’t rebounded like the Bluegill. 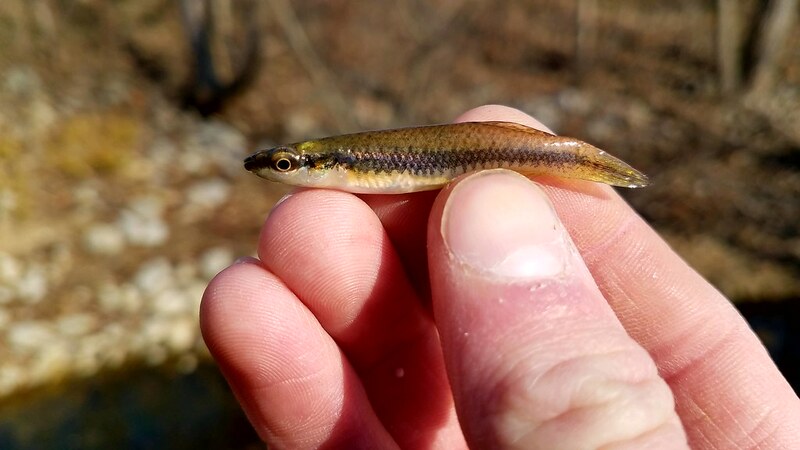 For some reason, the winter has sparked a large concentration of Redears to frequent the structure I like to ice fish. 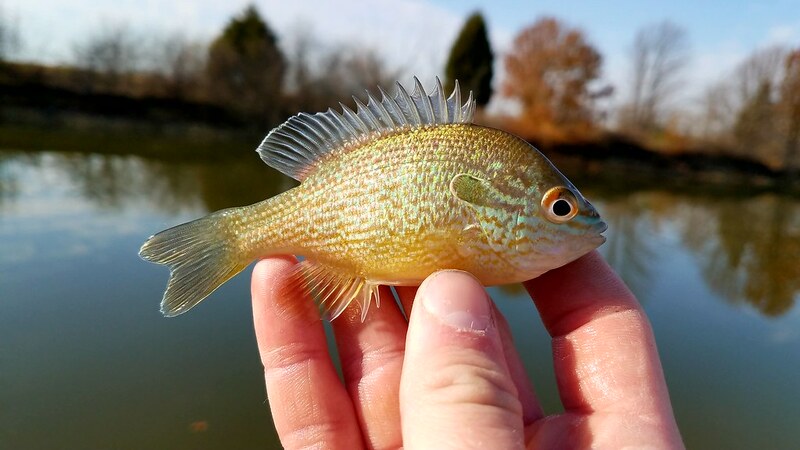 So far this winter, I’ve caught more of them than I ever have historically in a whole year. To me, these are the prize catch on a cold, winter day. 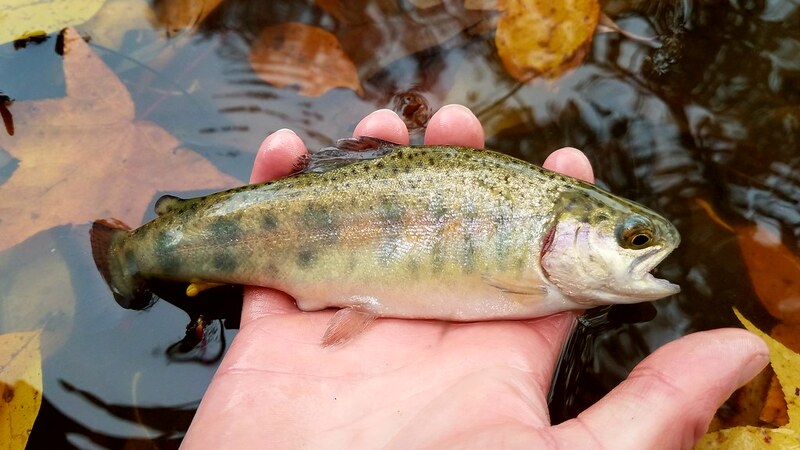 Their colors go unmatched in the winter scene; the trout can’t compare. Southern Indiana’s winter is fickle. Before long, the temperatures rise and the ice and snow melt away, letting the city sounds return. But for a short week, this little lake is turned into a winter paradise. I enjoyed the last day of safe ice with a bittersweet feeling in my heart. Half of me was excited to see winter giving up its grip, but the other half was sad to see it go. I know each season has its own beauties, but winter has finally shown its true potential to me. As the ice saw its last sunset, I couldn’t help but marvel at the scene before me. The trees are perfectly silhouetted against a fiery sky, while the snow, ever peaceful, starts melting. The sound of ice creaking and popping is clear in the air. This was the end of ice season. Not even I was foolish enough to venture on the ice again. A quick warm front and rain made any remaining ice rotten. A week passed and the ice was entirely gone. The season may have been short, but it will happily be remembered for years to come. This will go down as the year I started to love winter. I have always had this paradoxical obsession and hatred of the winter months. 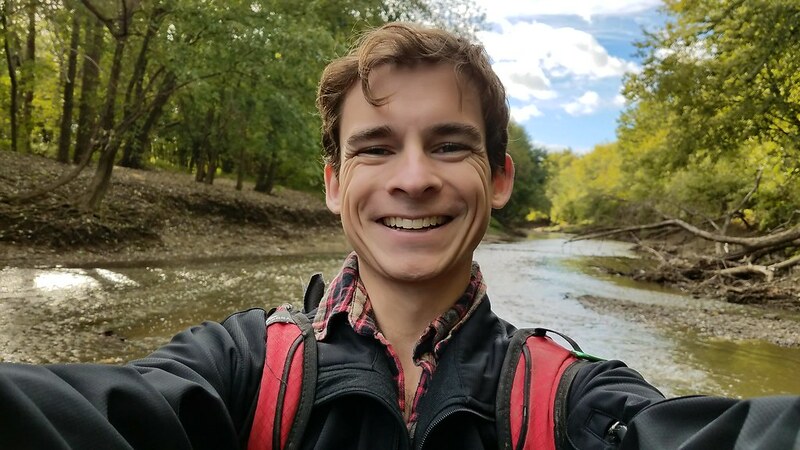 Part of me wants to prove that I am a true outdoorsman and that no weather can stop me from spending time outside, and the other part of me just wants it to be spring again and for green to start creeping into the forest. 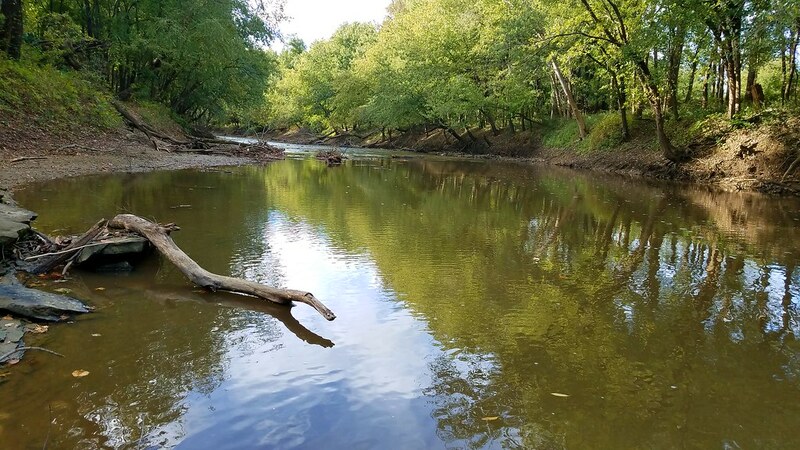 This strange dichotomy has fueled many of my fishing adventures in the winter months, though I will willingly admit that part of what always draws me to that outdoors this time of year is that rare peace and quiet that only exists in the winter. Early in the year temperatures fell well below freezing and an exciting thought kept occurring to me. This could be the year that I was finally able to catch a fish through the ice. A few days of brutally cold temperatures finally happened and an icy film started forming on the lakes, I had my fingers crossed that we could hit that magic depth for it to be safe for me to walk out on. But I wasn’t naive enough to count on that happening, so I did some early season scouting and I had a backup plan. Our ice thickness only hit an inch and a half, so the idea of safe ice disappeared quickly. Luckily, I had found a fishing pier at a local lake that had access to 6-8 ft of water directly off its edges. So, on a chilly Monday afternoon I bundled up in all of my winter gear, tossed my ice rods in the car and drove to my secret spot. 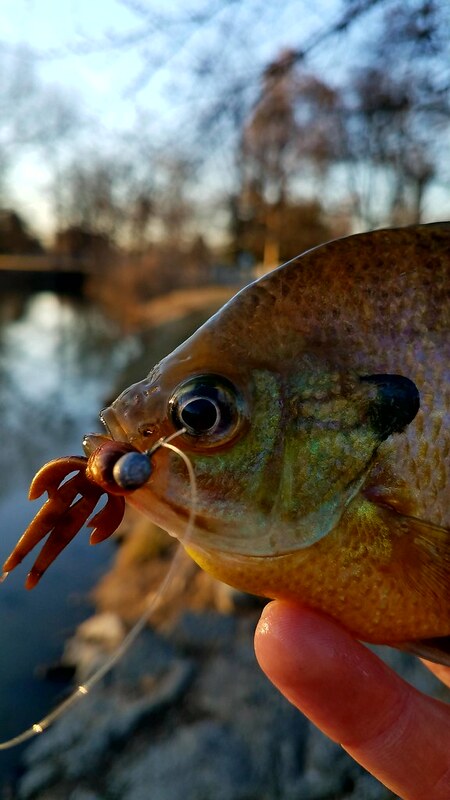 I wasted no time punching a few holes in the ice at the end of the dock and tied on a size 14 tungsten jig and tipped it with a wax worm. 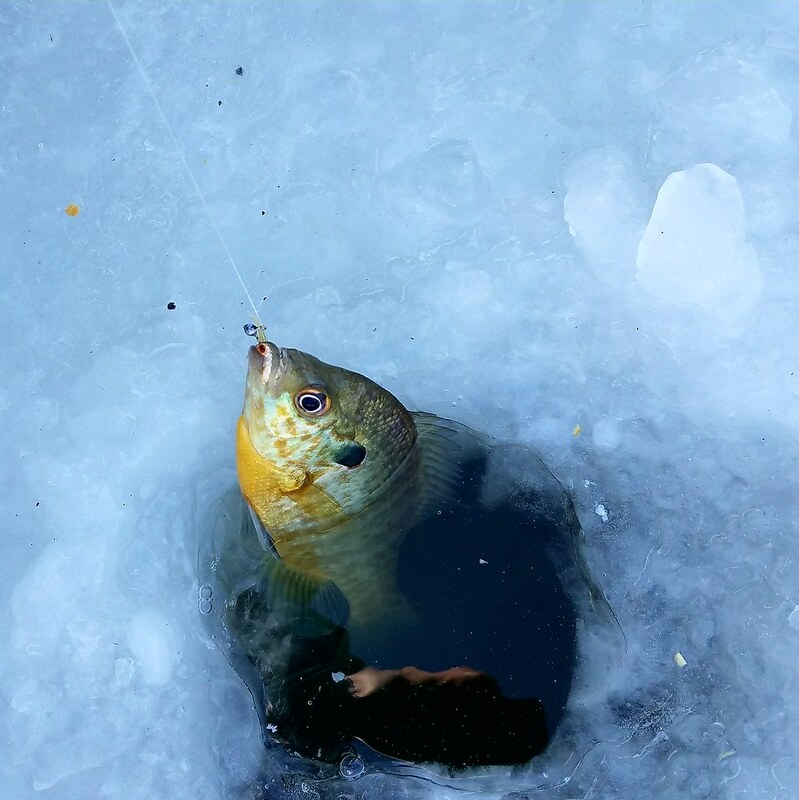 It didn’t take long before I felt a light tap, I set the hook hard and quickly saw the silhouette of a fish swimming under the crystal-clear ice. 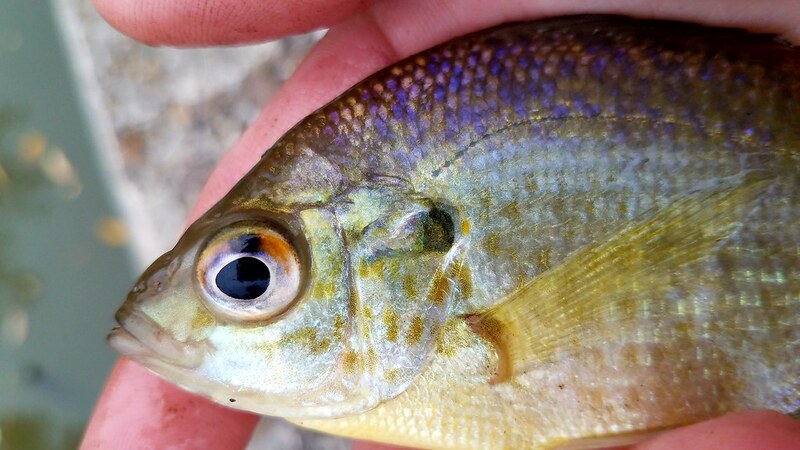 I carefully got the fish up through my crudely cut hole in the ice and was delighted to see a lovely little Bluegill. A quick photo session later and I released him back through the ice. I hadn’t in my wildest dreams thought that my plan to catch fish through a small hole in the ice would actually be effective. But after working my way through 2 containers of bee moths, I knew I had figured something out. 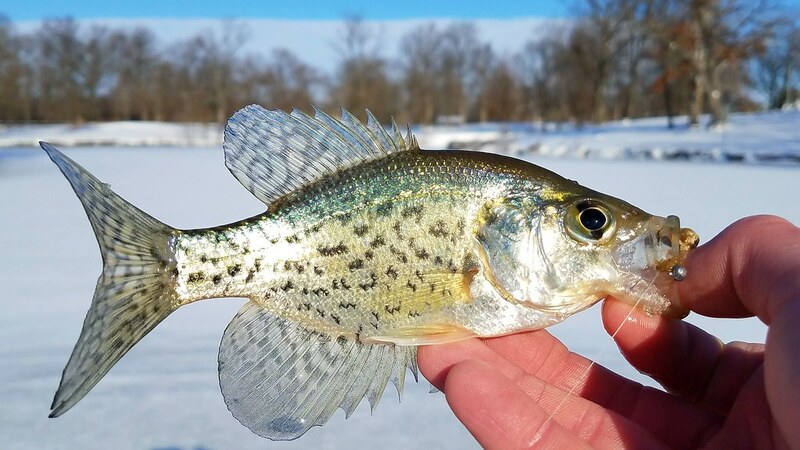 I was hoping I would be able to get my first crappie through the ice before calling this adventure a success. 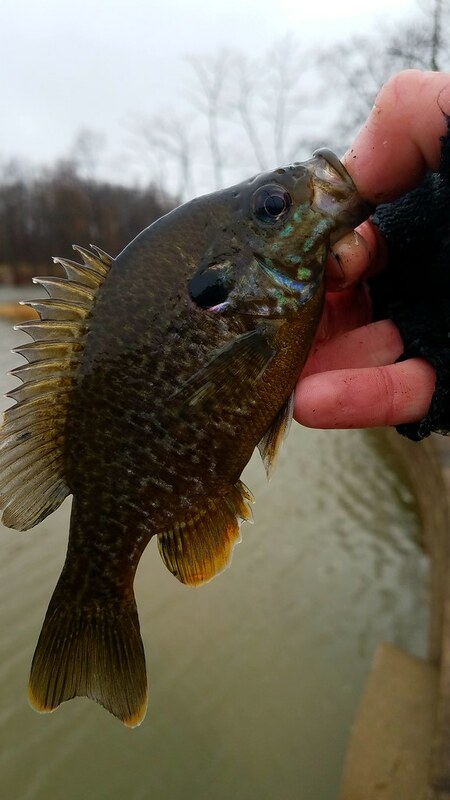 But instead I hooked into a small Redear Sunfish, another first for me through the ice. 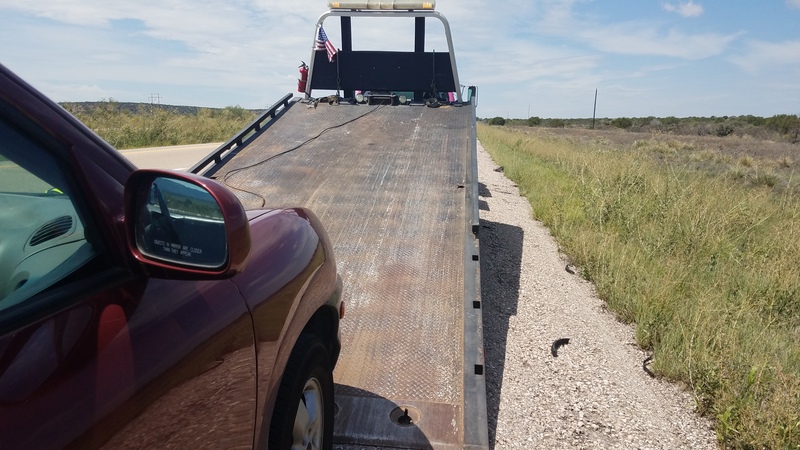 With this small victory, I retreated to the warmth of my car. That night I dreamed of returning to the ice before this fickle winter weather melted it, but between work and school I wasn’t able to return soon enough. 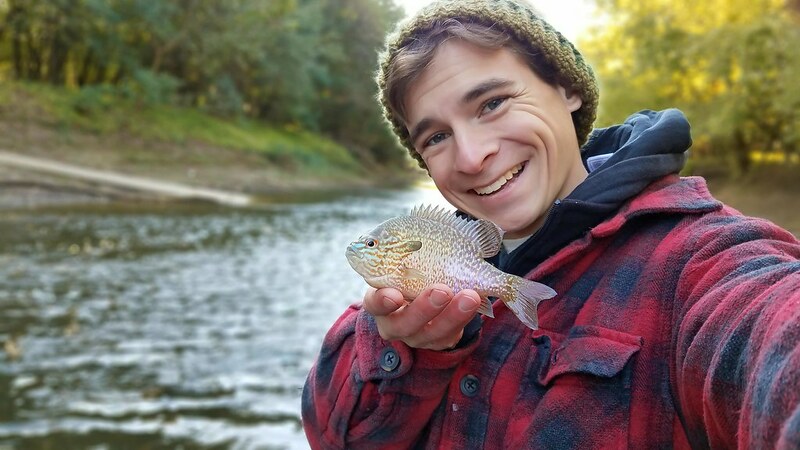 I was disappointed I wasn’t able to catch my first crappie through the ice, but I did mark an item off my bucket list: I caught a fish through the ice. The weather continued its odd habits and before I knew it enough rain had fallen for the Ohio River to be in full flood stage. 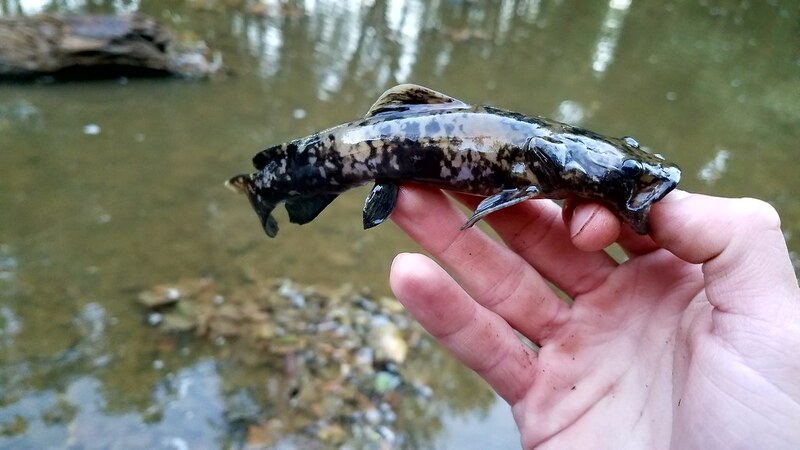 Most people would be fishing the river for the chance at a trophy Blue Catfish, but my target laid in a humble flooded out creek. 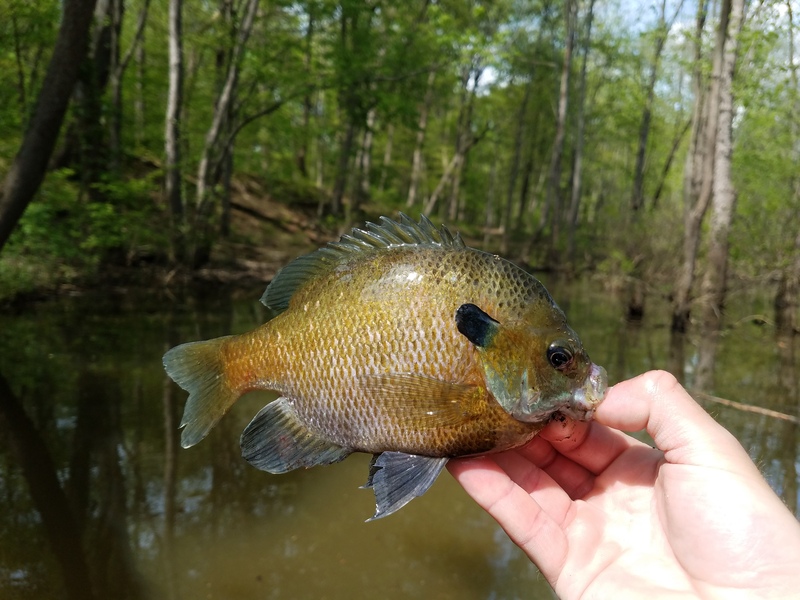 One of my goals for the 2017 fishing season was to catch a Flier Sunfish on my fly rod, and these high-water conditions provided me with the chance at this. 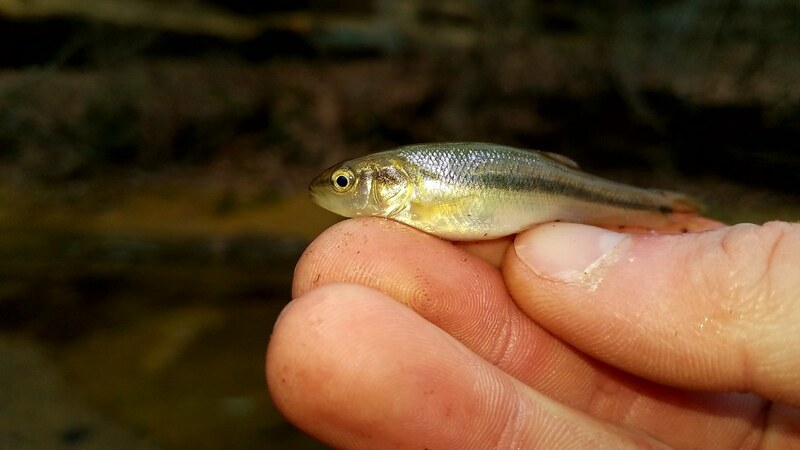 Armed with my 5 weight fly rod and a variety of size 12 minnow imitations I turned my focus to this creek. 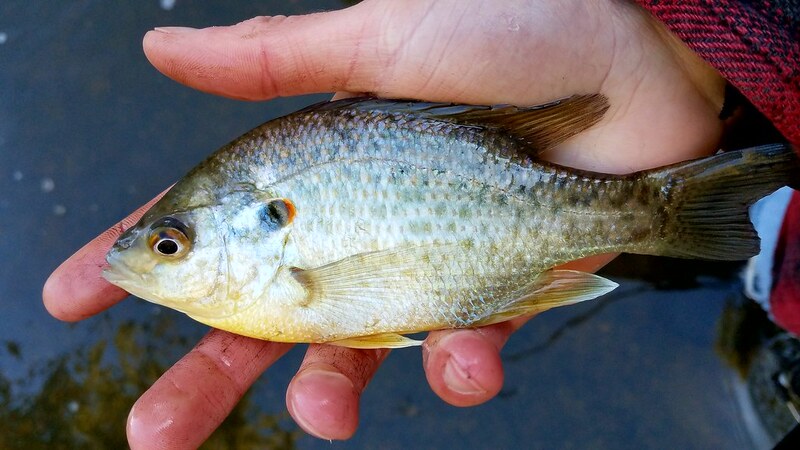 It didn’t take long for my first fly rod fish of the year to find my fly, a healthy little Bluegill. 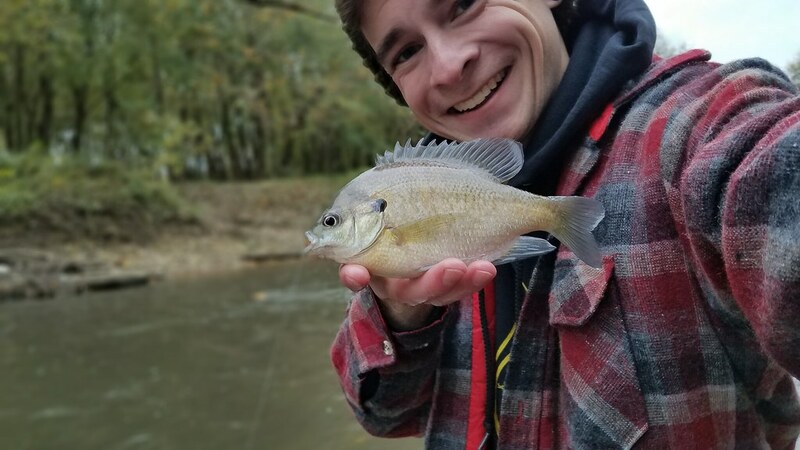 This fish gave me the confidence to keep fishing this spot, even with the cold-water temperature the high water seemed to have pushed a good number of fish into this stretch of the creek. I found some submerged stems from dead lily pads, and started targeting this feature. I knew that Fliers like to hug vegetation, and this was the only form of vegetation I could find in this creek. 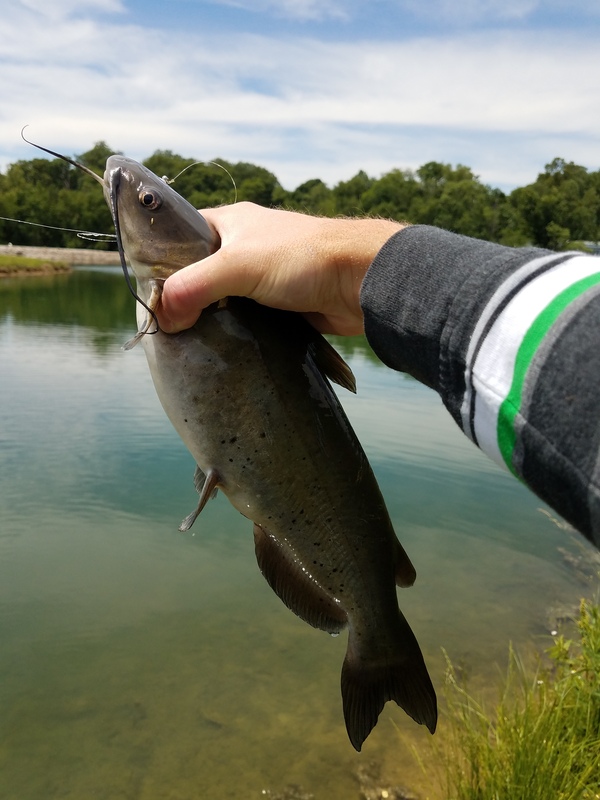 Finally, I landed the perfect cast on the edge of lily pad stems and slowly worked my minnow along them. 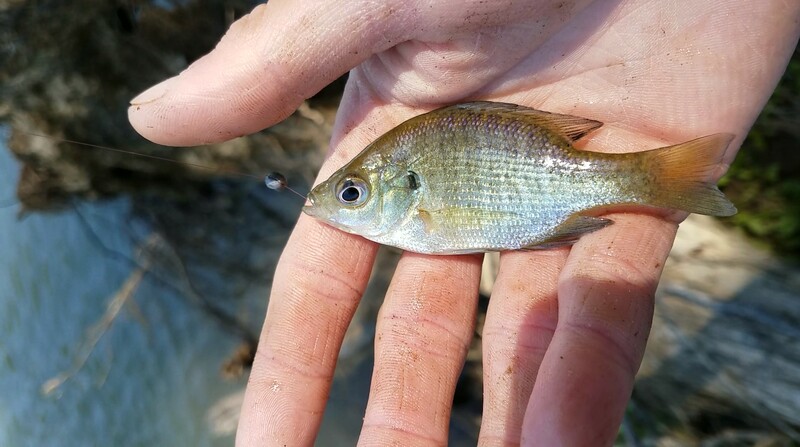 I saw the slightest twitch of my line and instinctively set the hook expecting another little Bluegill. 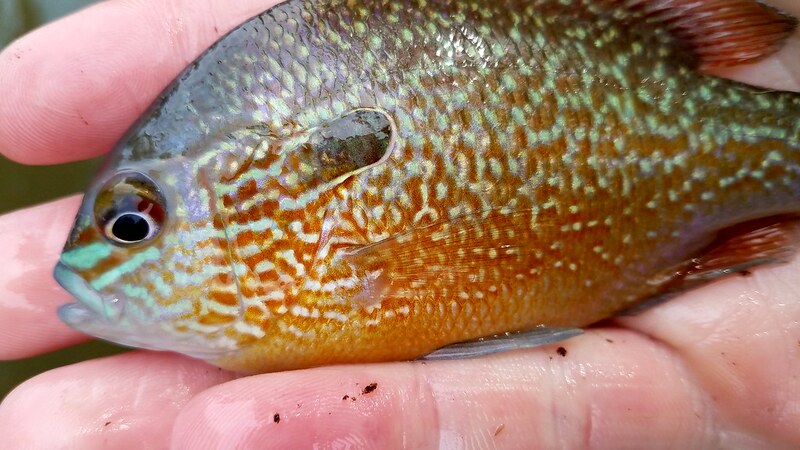 Suddenly a golden fish surfaced and I knew I had accomplished my goal, I quickly grabbed my net and landed my first Flier of 2017. To my delight this spot wasn’t holding only one Flier, but ended up catching three of them before I called the day. I snapped a quick picture with my nice camera before releasing them, this was the first time I’ve seen them take on such a vibrant golden hue. 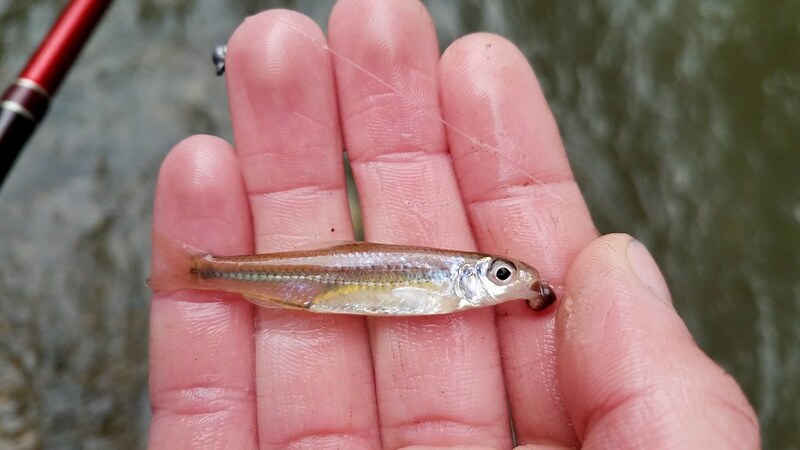 I put my 4-inch knife for scale in the picture, making the larger fish in the image below my new personal best. 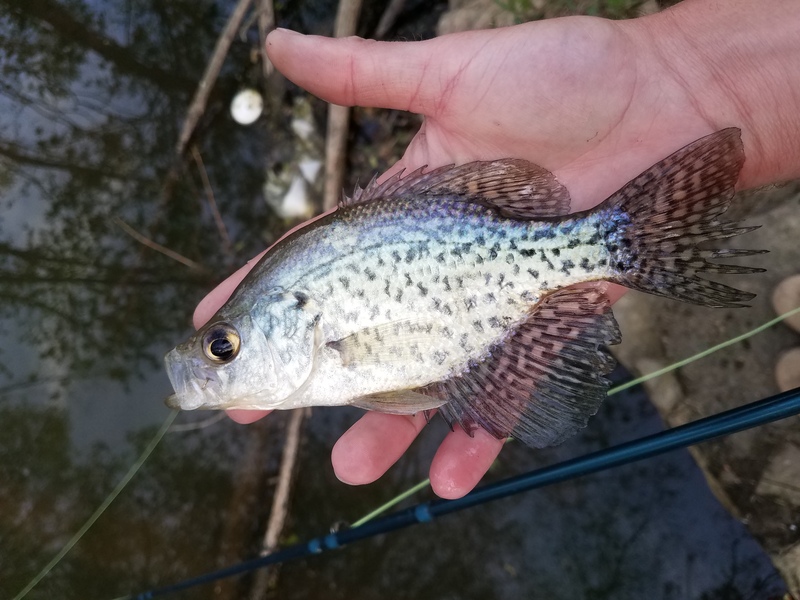 I couldn’t pass up the opportunity to try to catch my first fly rod crappie of the year while I was at this creek. 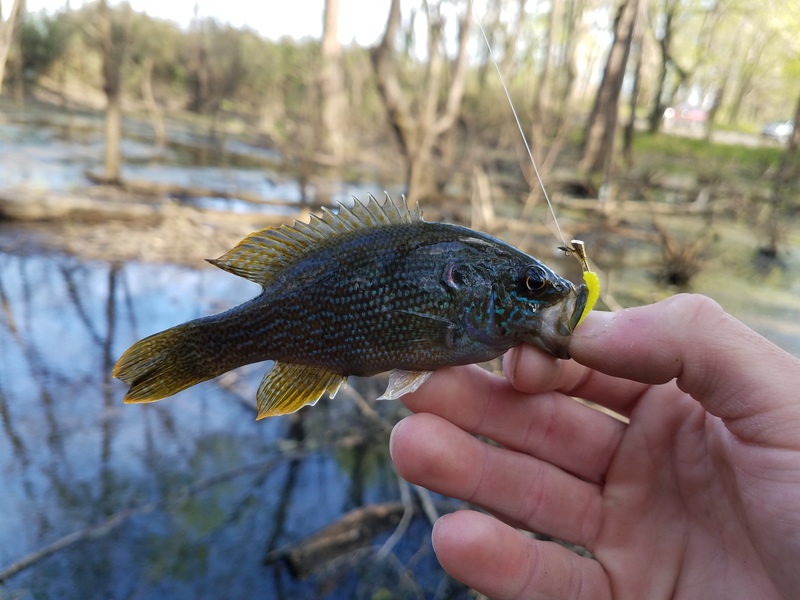 I knew from past years that this creek tends to be one of the first places to fill with crappie in the spring, so I was hoping with the high water a few little crappie would have traveled upstream with the other sunfish. 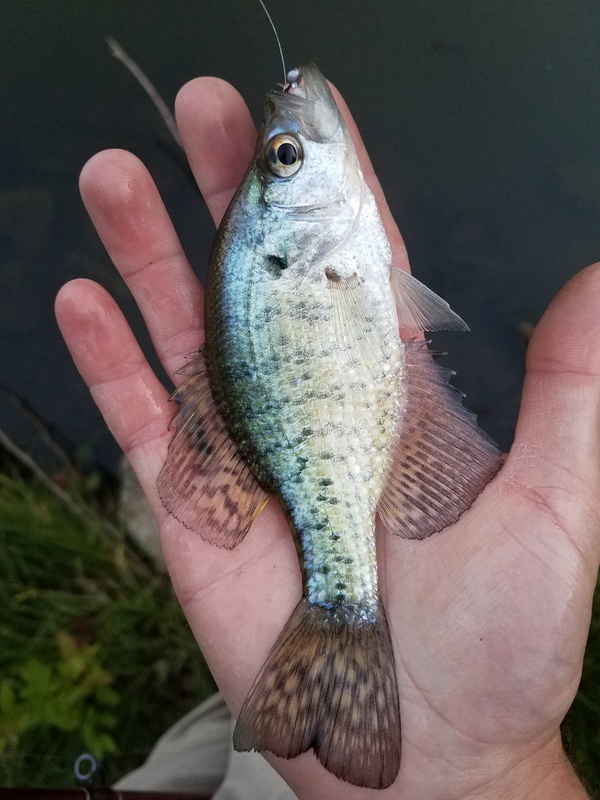 Much to my delight I found a school of small Black Crappie in the deeper section of the creek. 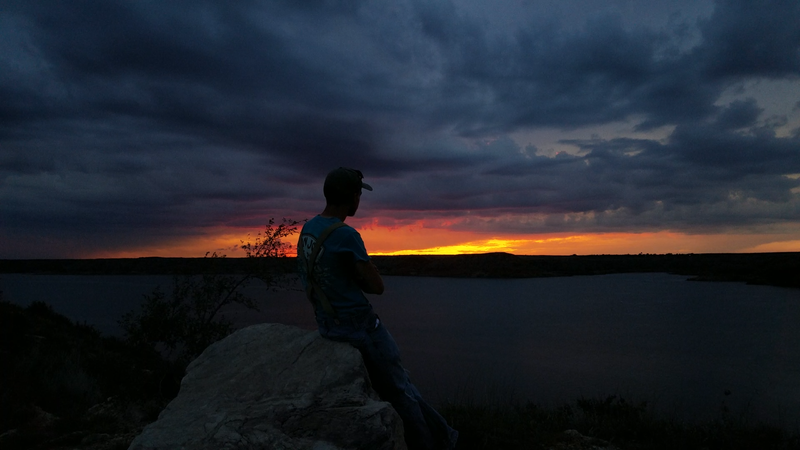 Another week passed and the weather had continued to warm up, my dreams of learning how to catch fish in the cold were starting to disappear into dreams of fishing crappie spawn. I put in extra hours at work early in the week so that on Friday I could take a half day and enjoy the unseasonably warm weather. 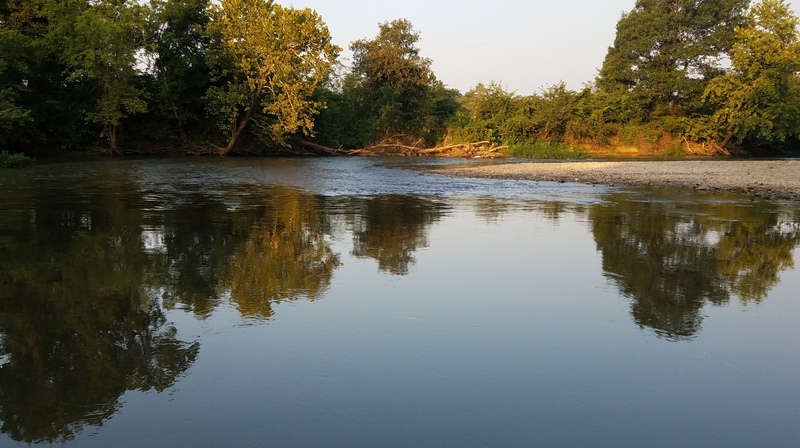 I had been spoiled by the early season fly fishing and just couldn’t seem to shake the fly fishing itch. 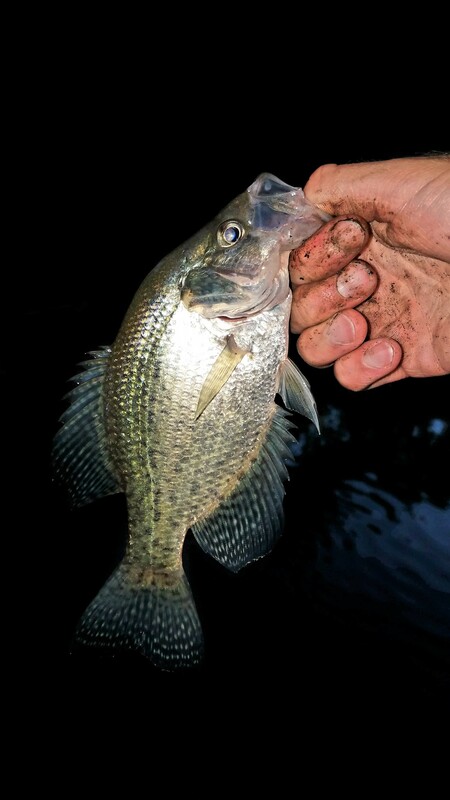 As soon as I got off work I made my way to one of my most reliable lake with hopes of finding some willing Bluegill. 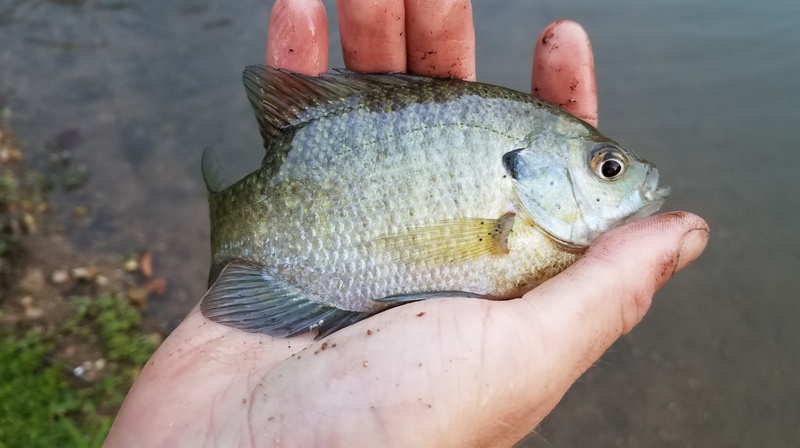 It didn’t take long to find some hungry Bluegill that had moved up into shallow water. 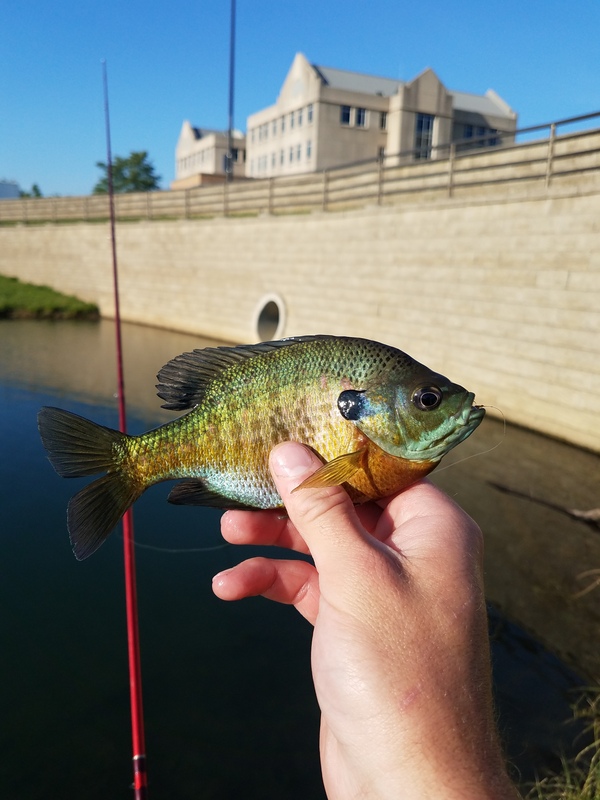 A few casts with a small wet fly resulted in my first Bluegill of the day. 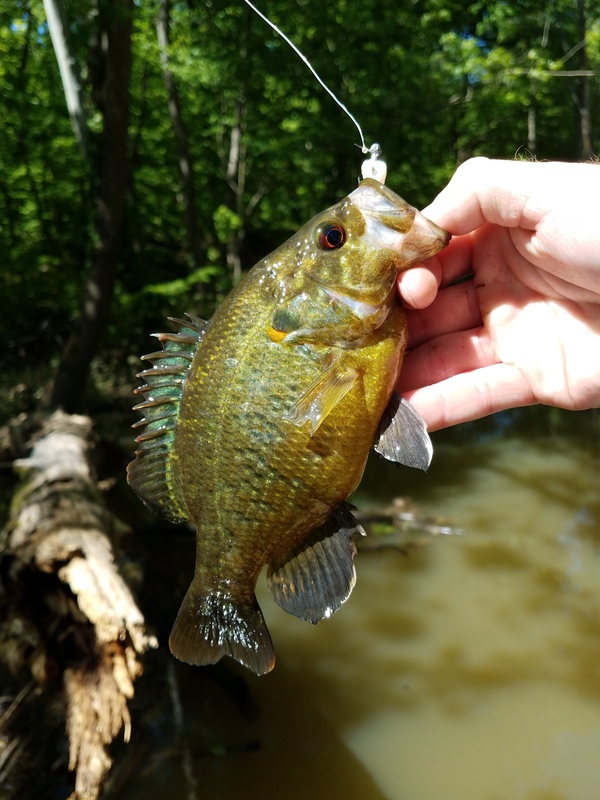 There seemed to be no shortage of Bluegill up in the shallows, I was even able to get them bold enough to rise to surface and strike at top water flies. 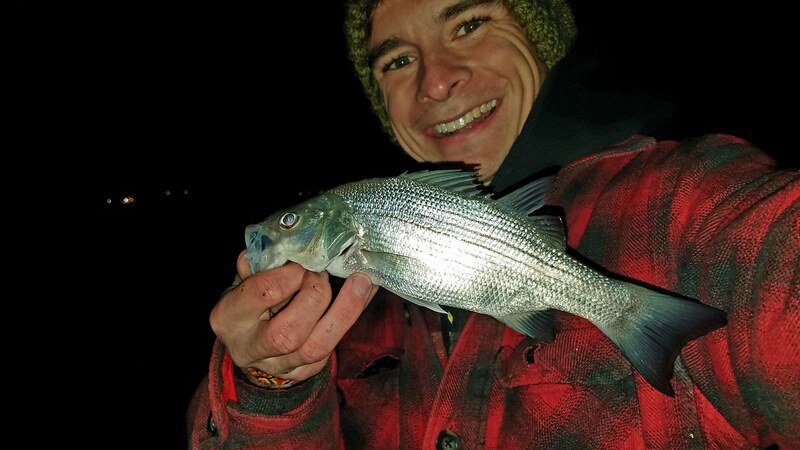 I couldn’t help but smile like a little kid with the idea of catching fish on top water in the dead of winter. 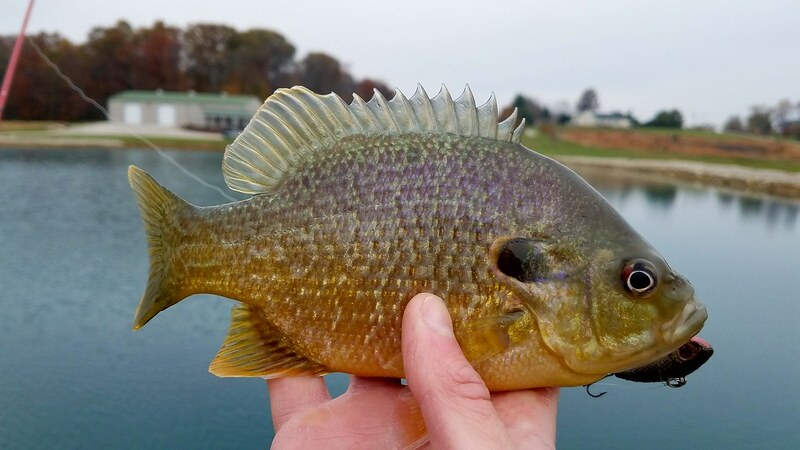 After catching my fair share of Bluegill I moved over to the deep end of the lake with the wild idea of targeting some of the crappie in the deeper water. 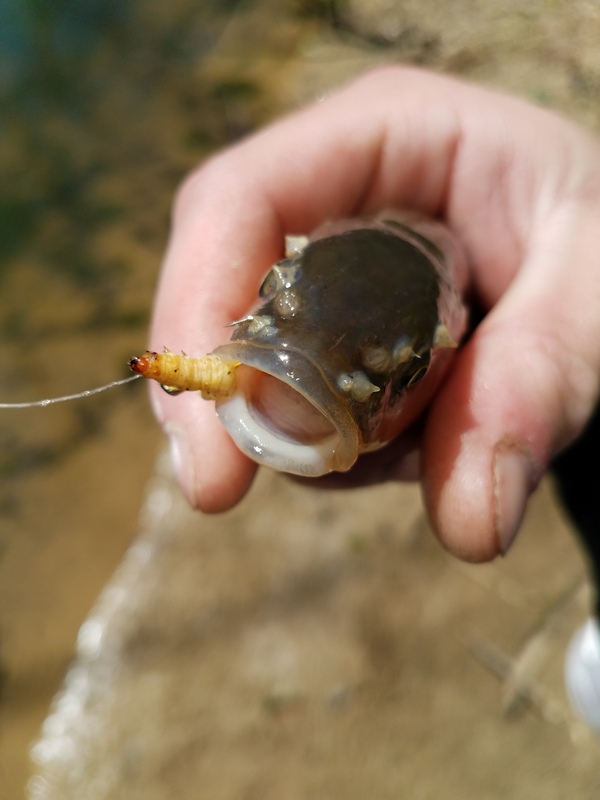 I knew that the chances of this working were slim since I was fishing with floating line and a very short tippet. But after about 20 minutes without a fish my line made an uncharacteristic twitch and I set the hook. 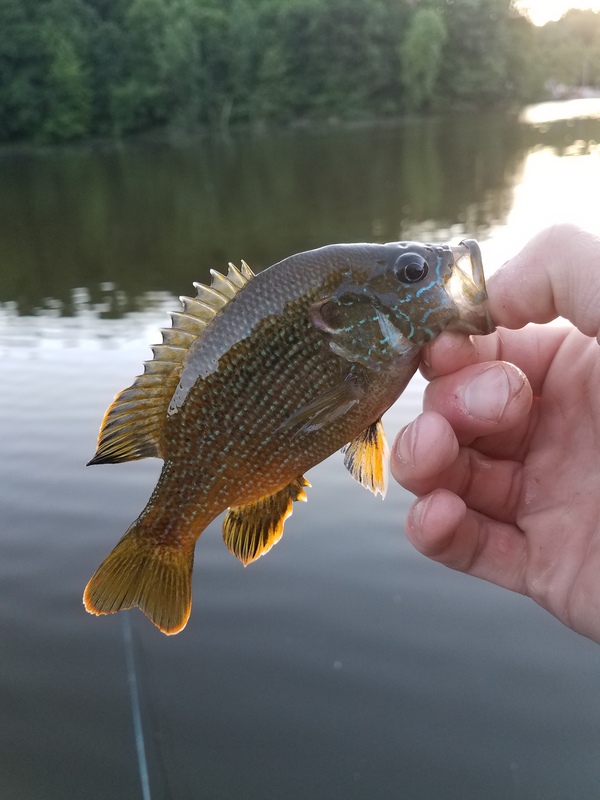 To my surprise I wasn’t snagged, and was battling a small crappie. 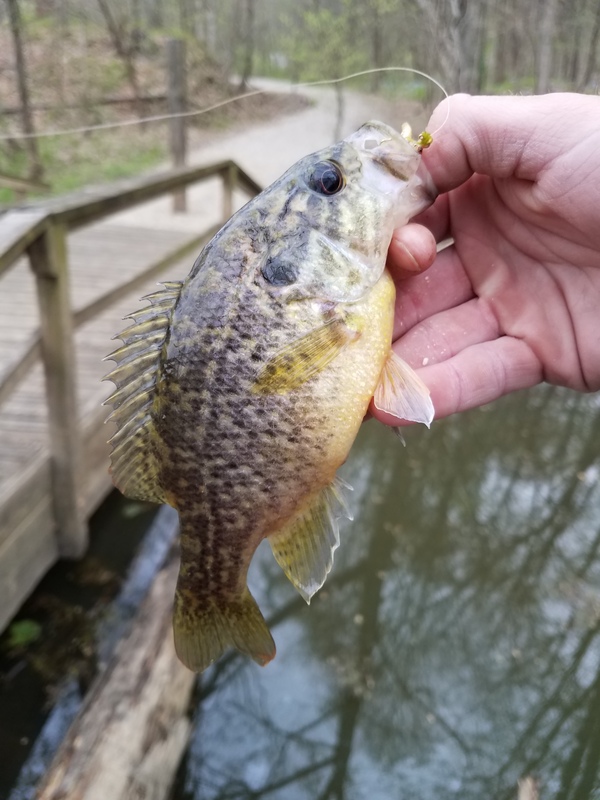 A quick fight later I was holding my intended target, a small White Crappie (also the first White Crappie I caught on the fly rod in 2017)! 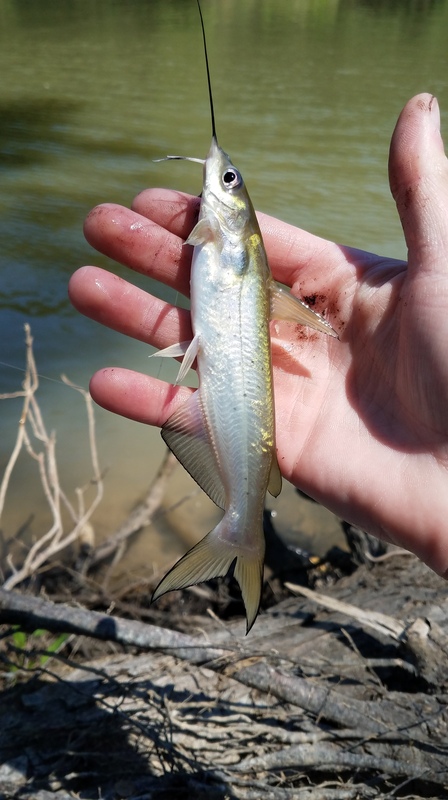 The rest of the fish I caught that day faded in comparison to the excitement I had catching this little fish. The weather continued cycling from freezing cold to surprisingly warm as the winter got older. But I wasn’t going to complain about the idea of being able to fish in a long sleeve shirt, even if it only lasted for a day. 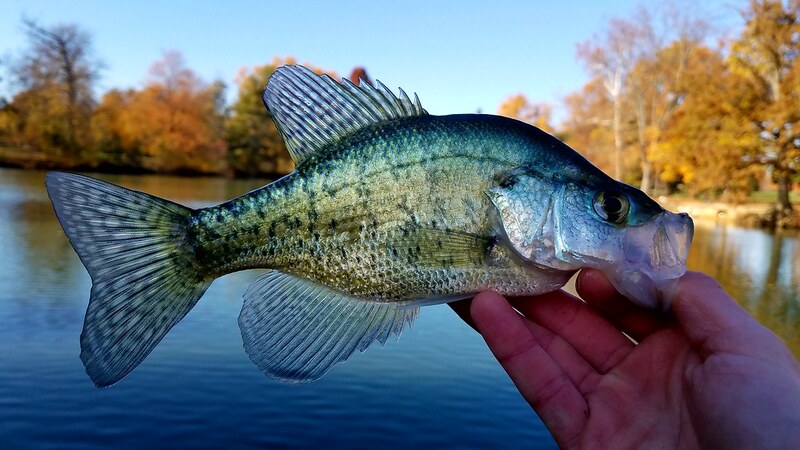 I took advantage of the warm days while they lasted and turned my attention over to catching more White Crappie. 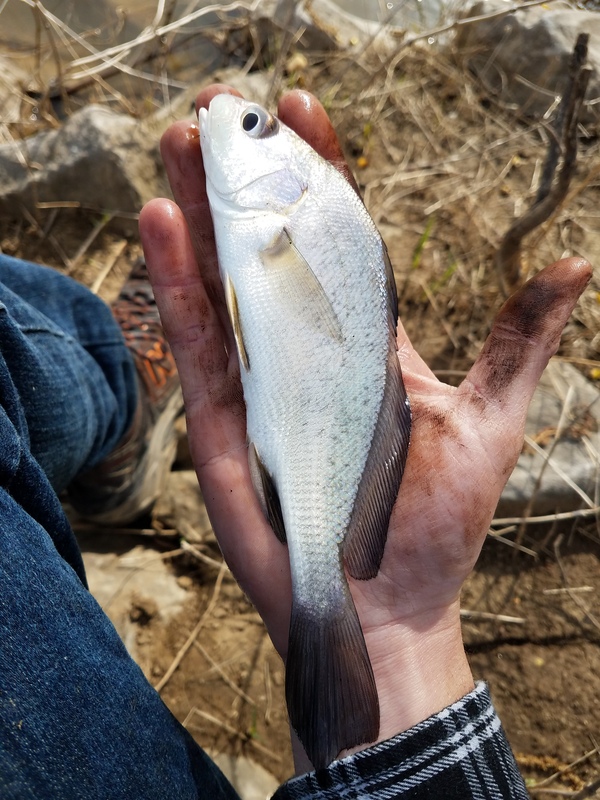 The warm weather had scattered the fish throughout the water column, and these conditions are a dream for a fisherman like me. 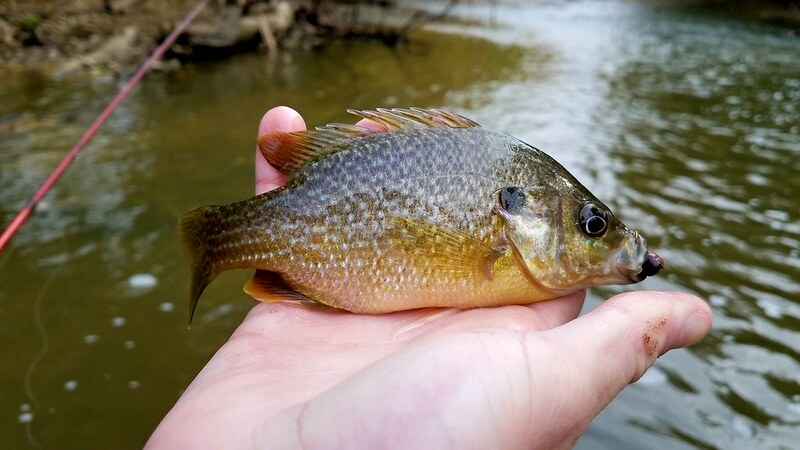 It didn’t seem to matter what depth I was fishing at I would hook into a fish, mostly they were Bluegill. 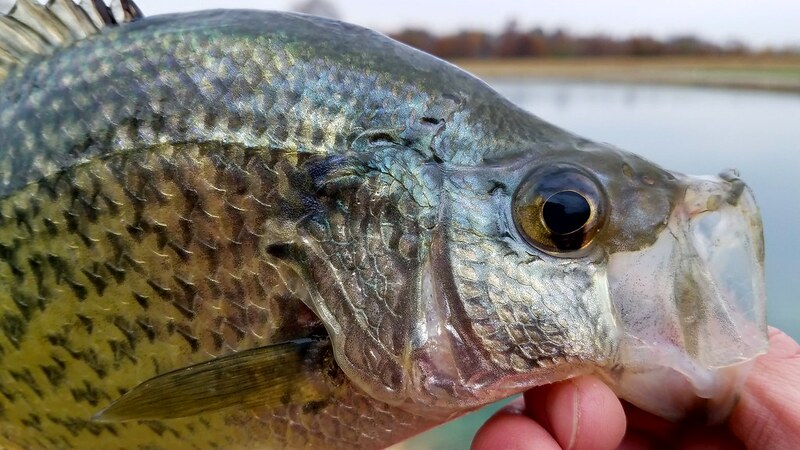 But occasionally a Largemouth Bass would find my hook before a Bluegill could, and on rarer occasions a White Crappie would do the same. 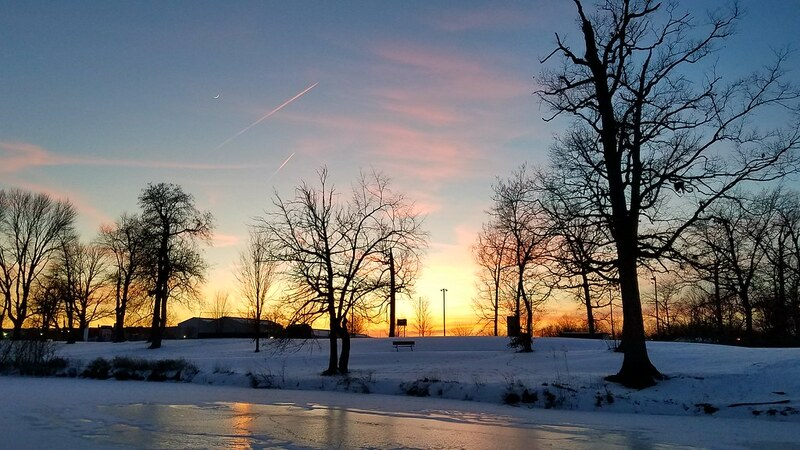 The warm weather was quickly replaced with a bitter cold wind that dropped the temperature across Indiana. Once again a thin layer of ice started forming on the lakes, but the sun came back out and melted this off quickly. 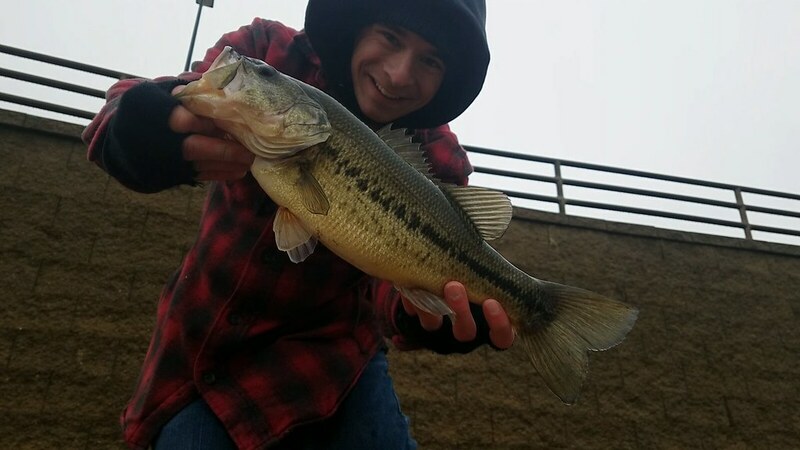 This quick cold snap followed by a lot of sunlight had the bass in a feeding frenzy, and I seemed to be the only one brave (or crazy) enough to go out and try to capitalize on this bite. 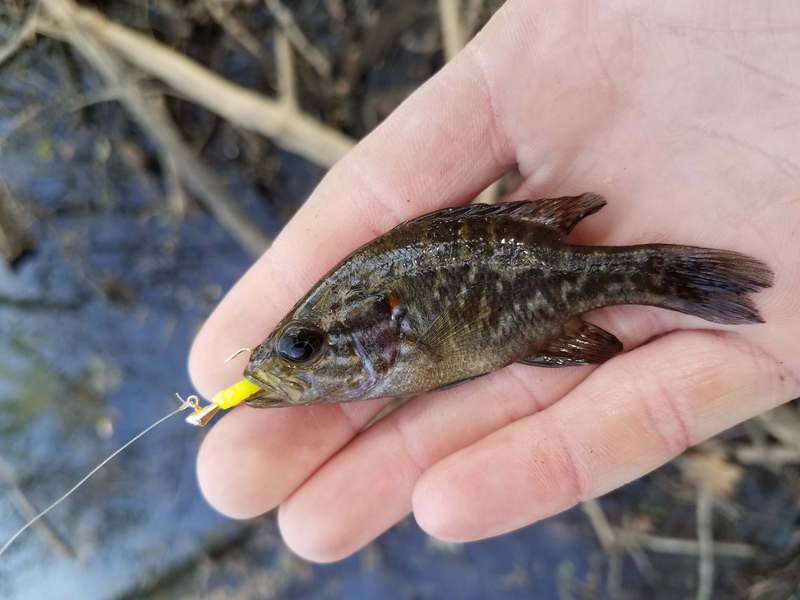 When I know fish are in feeding fairly aggressively I like to tie on two white grub lures and fish them at different depths. 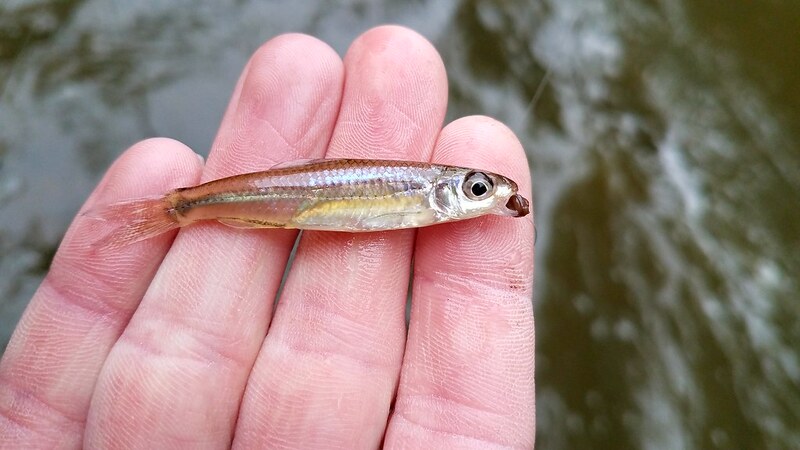 This seems to mimic a small group of bait fish, a sight a hungry bass just can’t resist. 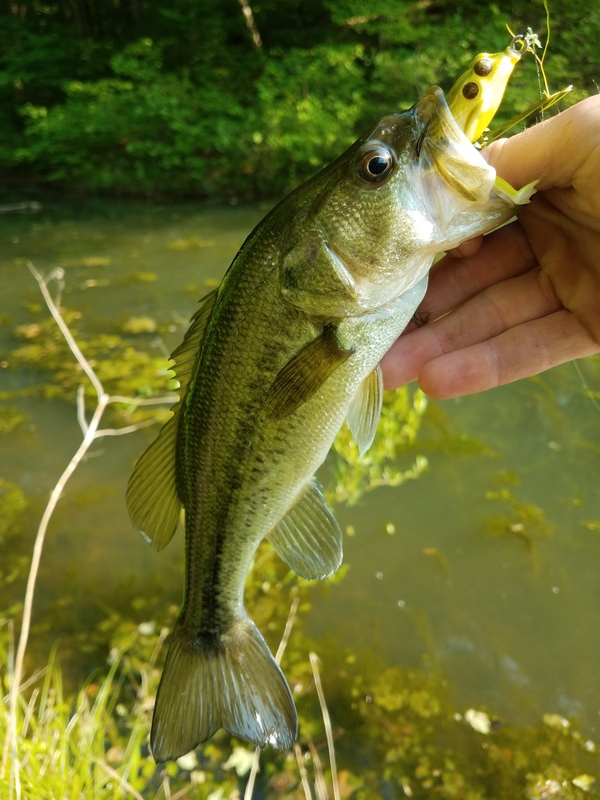 It didn’t take long for me to hook into a handful of small bass, but on the last cast of the day I set the hook into a fish that actually started pulling some drag. 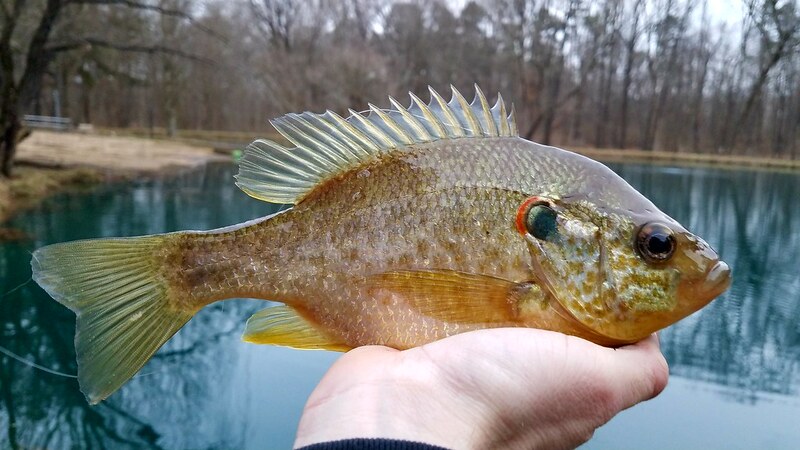 This has one of the strangest winters I have ever experienced, but it has offered some new challenges that are helping me improve my fishing skills. 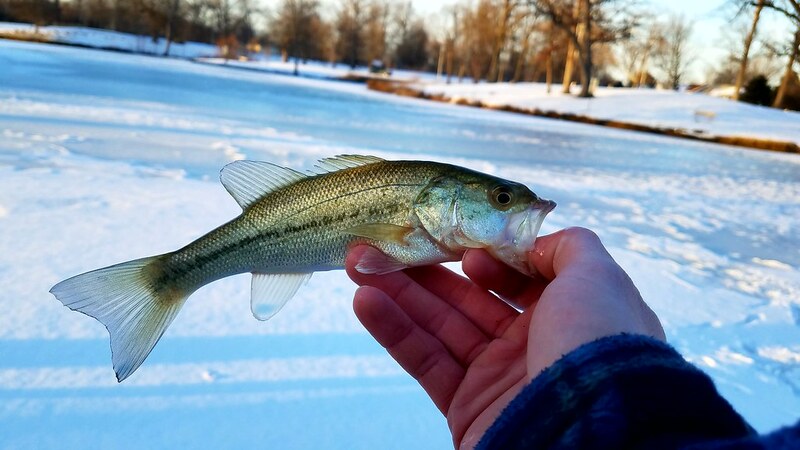 Easily my favorite challenge of winter was getting the chance to catch a few fish through the ice. I hope you all have been able to make the best of the odd weather we are having this year. 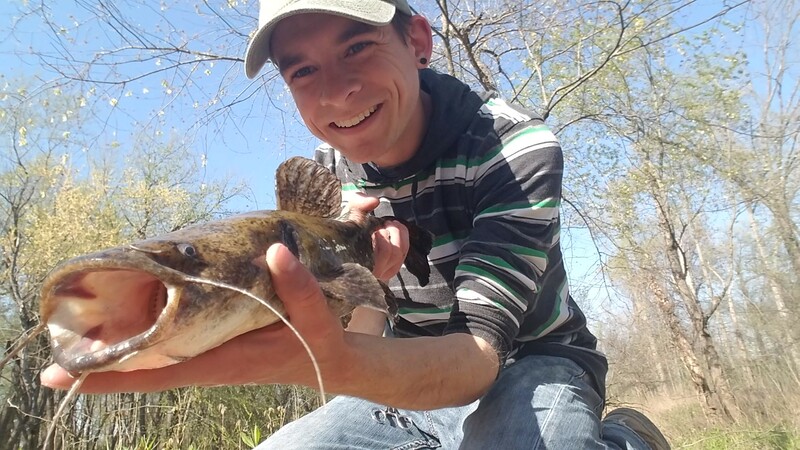 2016 has been one of my best fishing years yet and I thought it would be fun to do a quick review of the best fishing trips of the year. 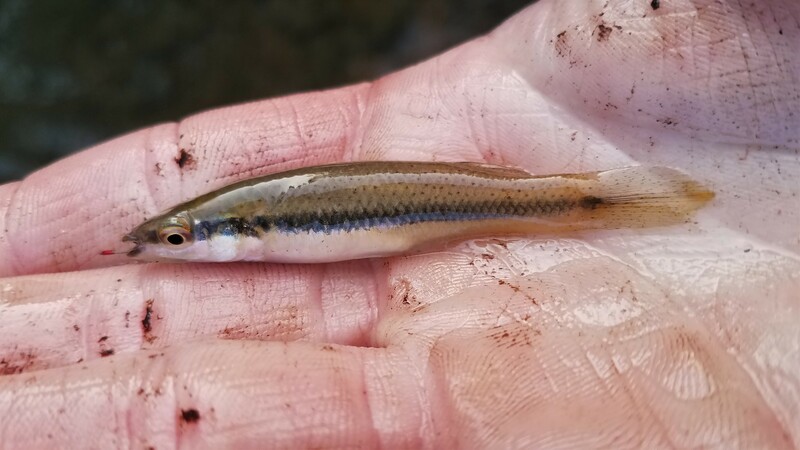 I caught a record number of fish this year and managed to bump my species list up 45 different types of fish! 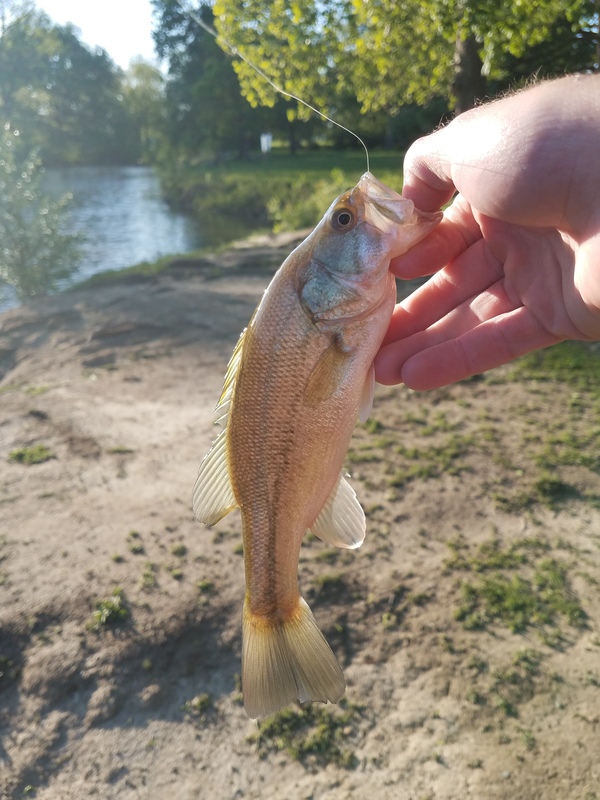 I thought a good place to start would be with some of the best bass I caught this year. 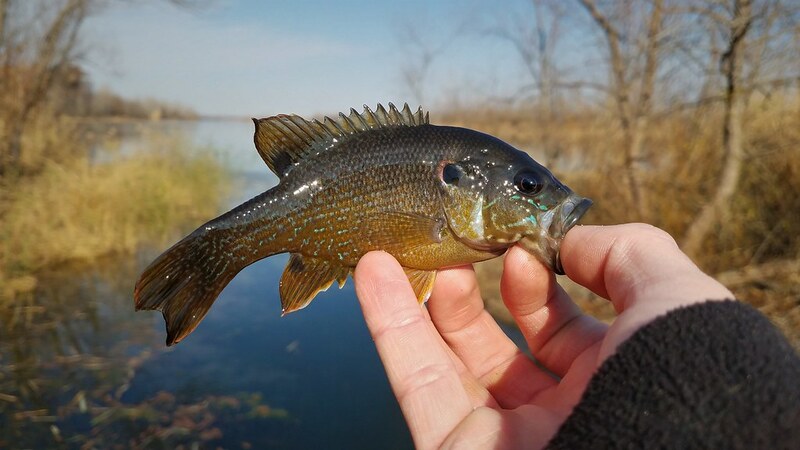 The first big fish I caught was during early spring, while I was fishing for crappie. 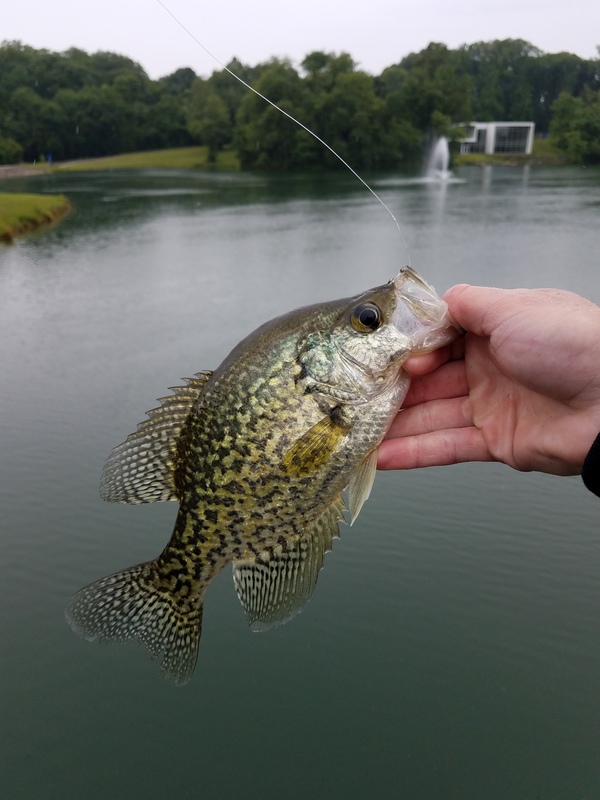 I wasn’t really expecting to catch any big fish that day; I was fishing with an ultralight rod with 4 lb test line, hoping to get a limit of crappie. 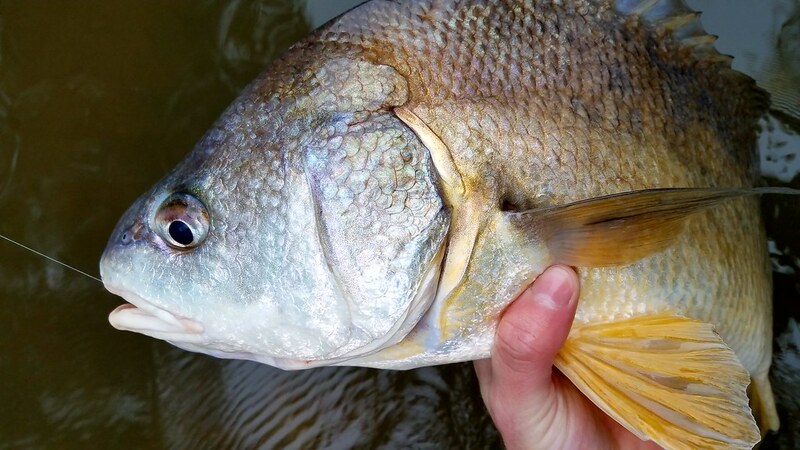 But while jigging a 1.5 in fluke, something much larger engulfed my lure. 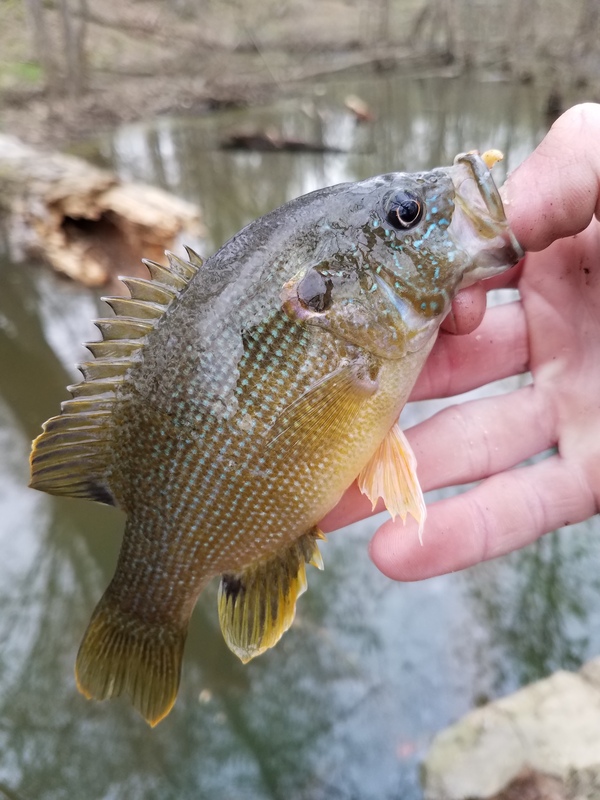 Luckily, the water was cold and the fish was a little sluggish, so I was able to carefully work it out of the fallen tree it was hidden in. 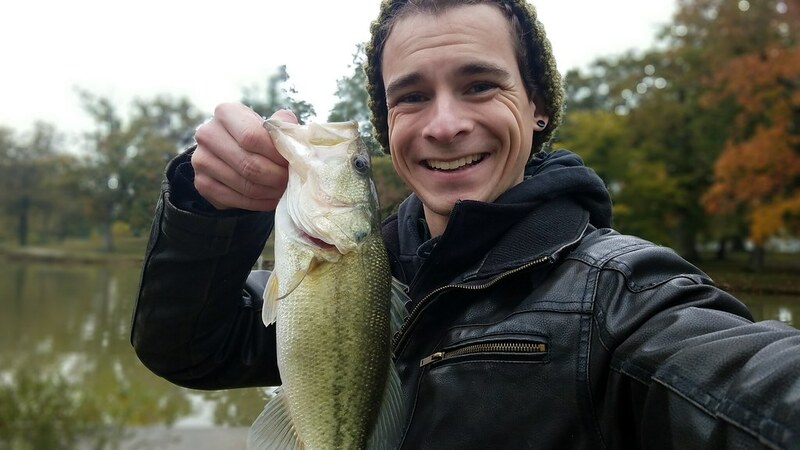 As you can see, I was pretty excited to catch this 5 lb 9 oz beauty! 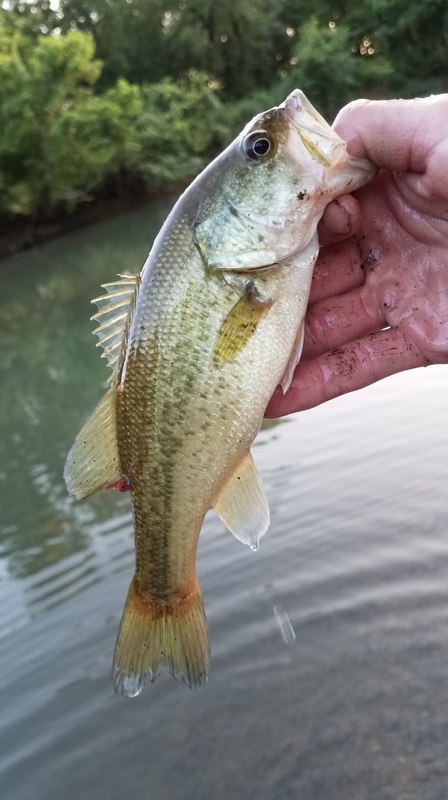 The next big bass I came across was during prespawn. I was exploring new places to fish and came across a series of beaver ponds in one of my favorite federal wildlife areas. 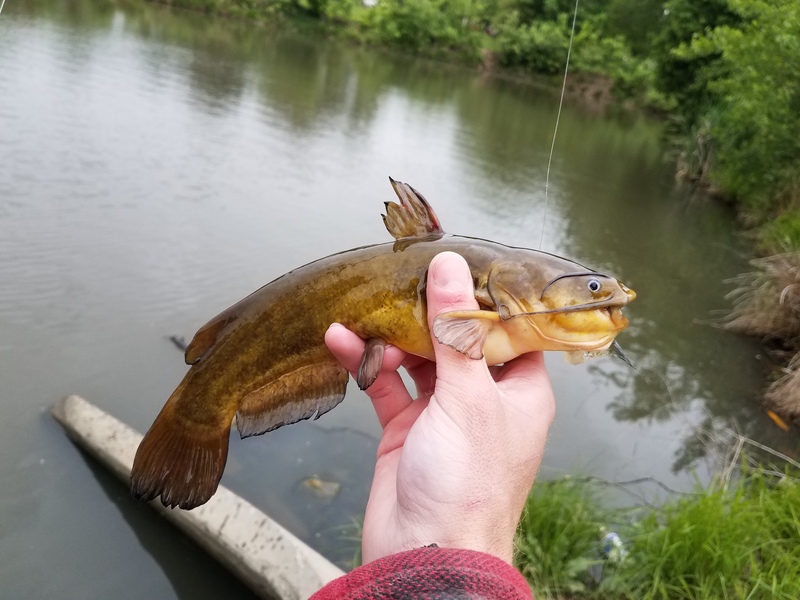 I found a shallow cove with an old abandoned beaver dam and knew that at some point the big fish would have to move from the deep water to spawn in the shallow area. 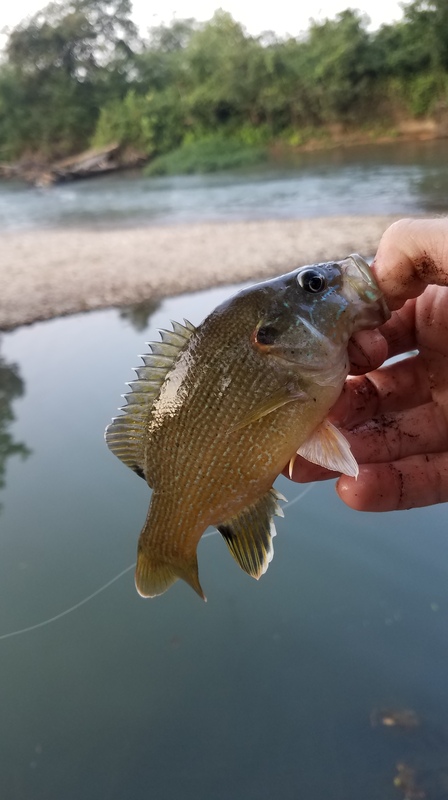 I fished this spot religiously for a few weeks and caught a lot of fish in the 2-3 lb range, but I just couldn’t connect with a big fish. 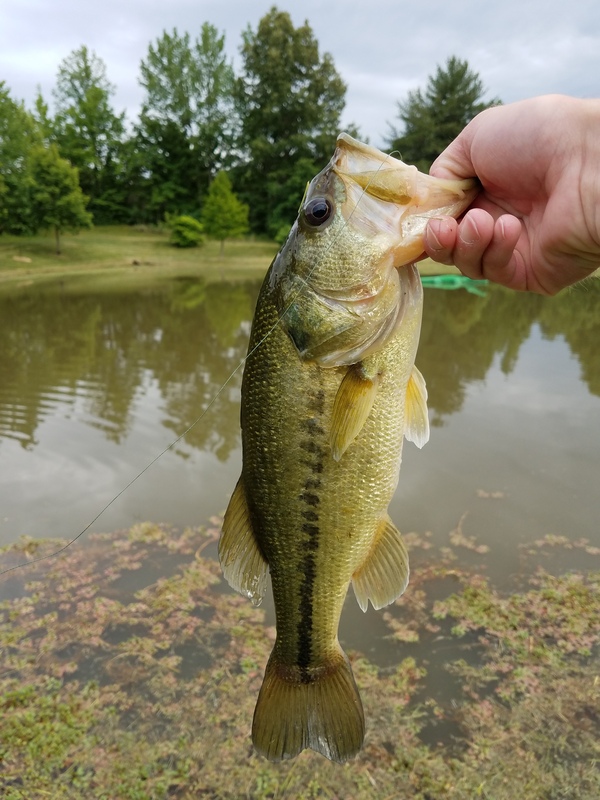 After a few weeks, I was starting to give up on my mission, but then I struck gold: a 6 lb 6 oz tank of a bass. 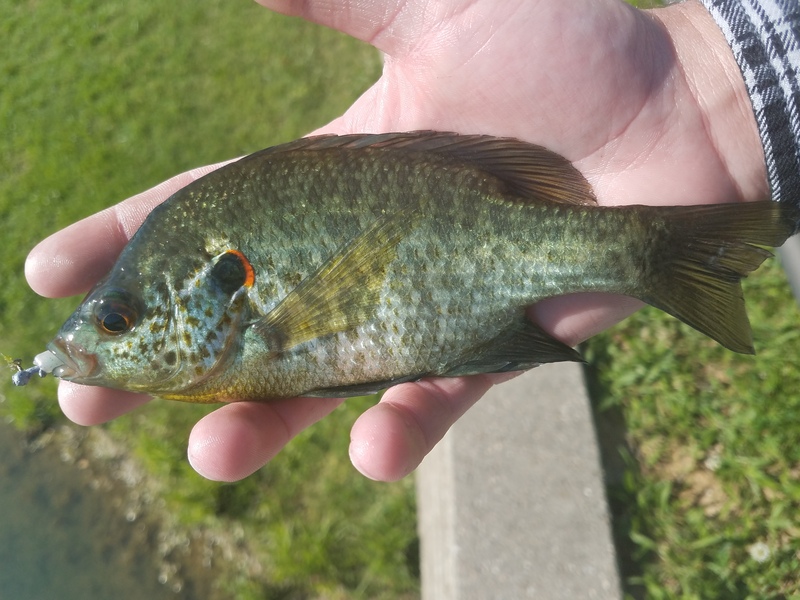 After this fish, I really just started focusing on catching numbers instead of size. But as many of us know, once you catch enough fish you are bound to catch a few big fish, too. 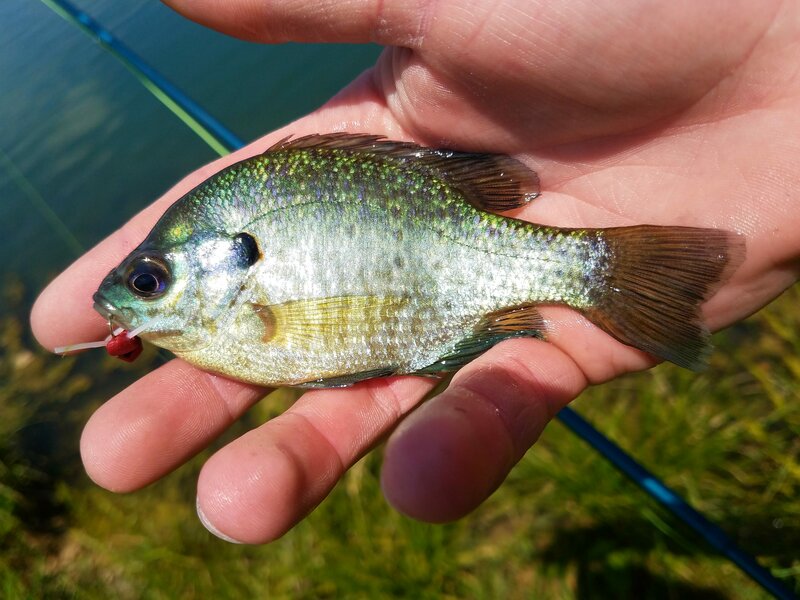 Throughout early spring, I got hooked on catching fish on top water frogs and caught a ton of little fish on them. 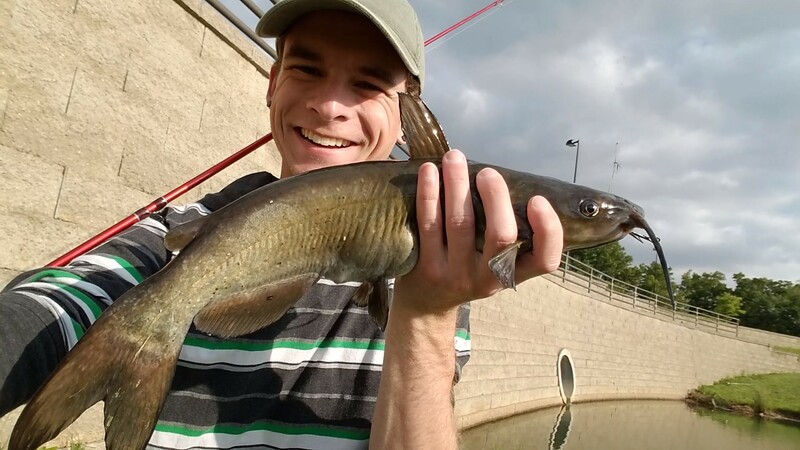 But one day, right before a big storm front pushed through, I fished one of the many public ponds close to school. 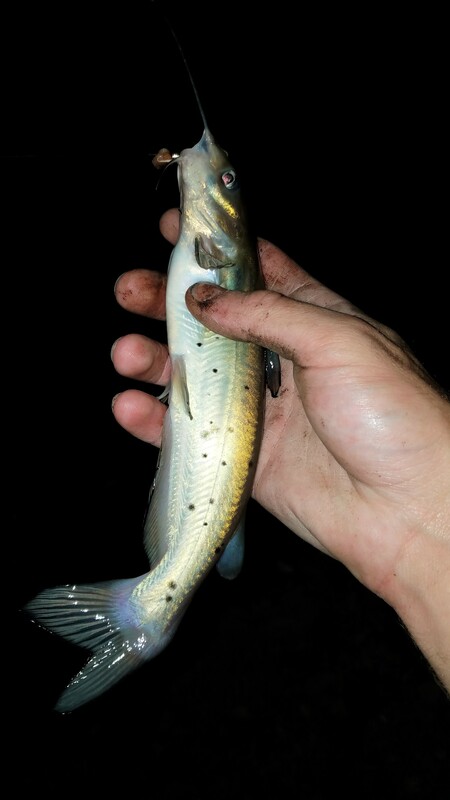 I was really just hoping to catch a couple little fish before the rain started. 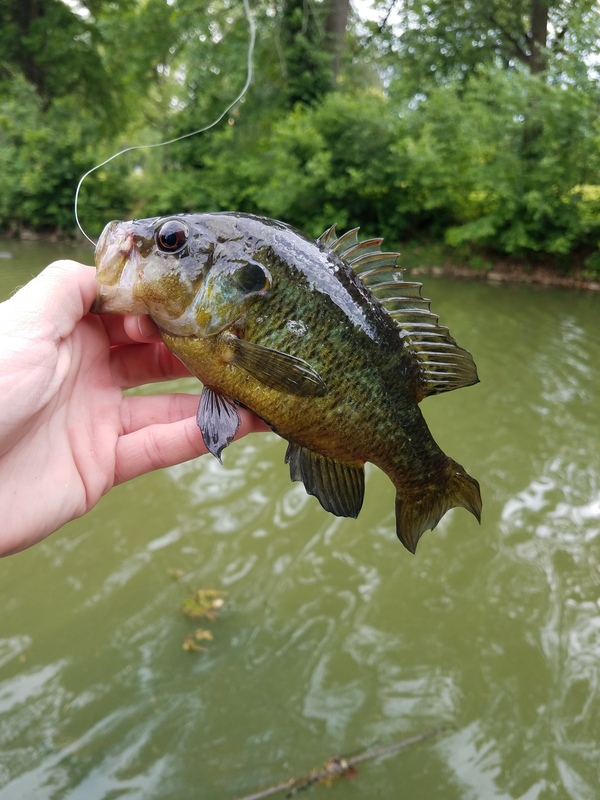 But today held something different in store: right as the wind was starting to pick up, a big fish smashed the surface after my frog but totally missed it. I twitched the frog a few more times and it smashed the frog again, this time taking the frog under. 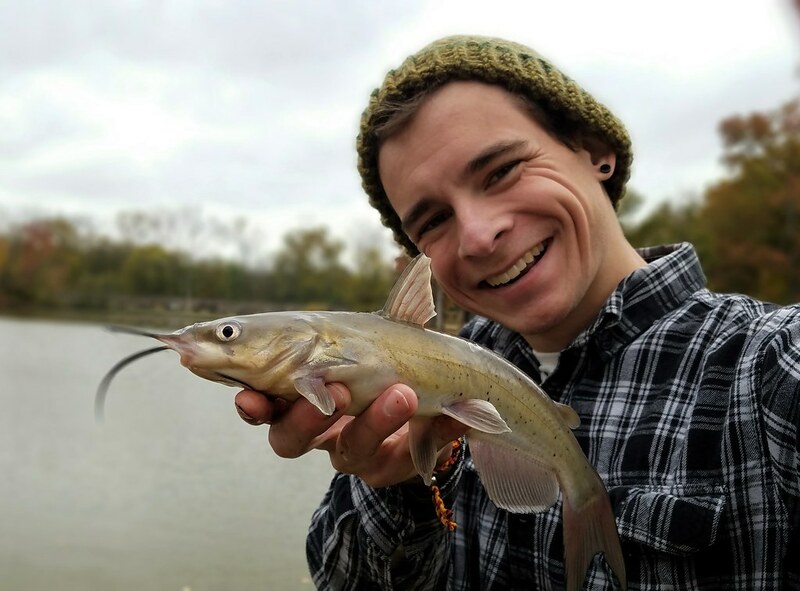 I set the hook so hard I lost my footing and slid down the bank into the pond. 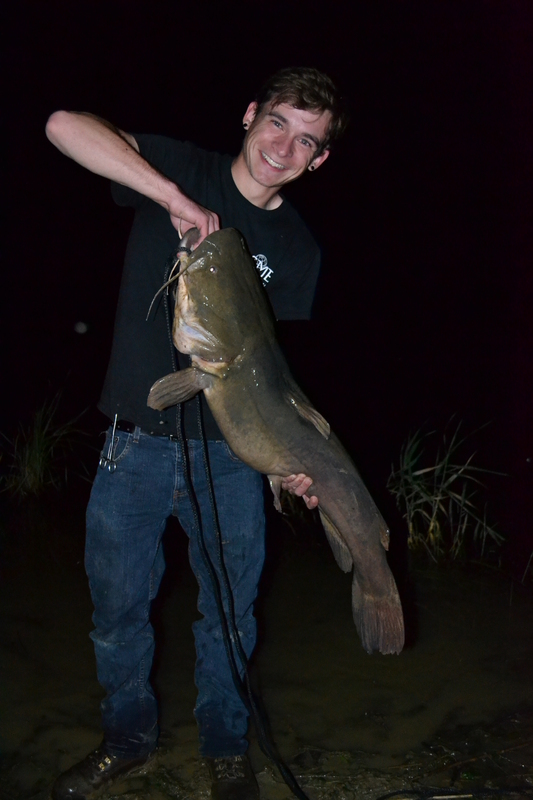 I fought the fish while standing knee deep in water and landed the biggest fish I had ever seen in this lake. My scale put this fish at 6 lb 1 oz, but I’ll be honest: I don’t think I really buy that number. The last fish was by no means a monster, but it was one of my favorites of the year because it was a great trip with a close friend. 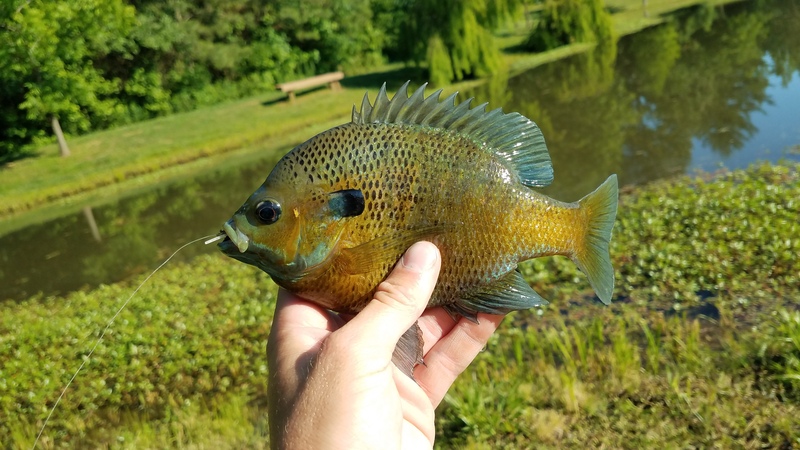 I had always heard rumors about how good the fishing was at Sugar Ridge FWA, but the first lake we fished was full of stunted fish. I was a little disappointed at first, but this FWA has multiple lakes, so we switched to a new lake. 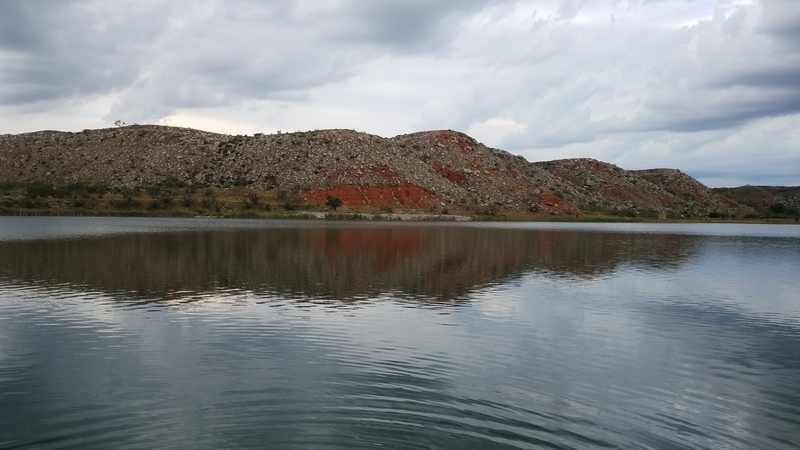 We didn’t catch a lot in this lake, but all the fish we caught were quality. 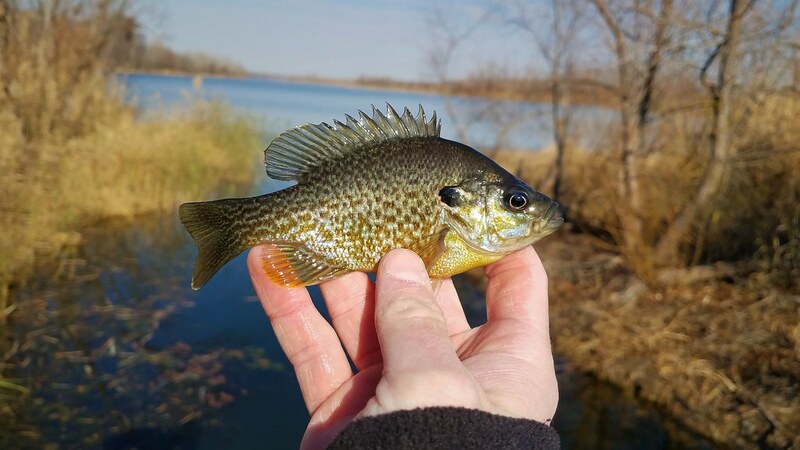 While I did catch some nice bass this year, I really focused more on panfish than I ever have before. 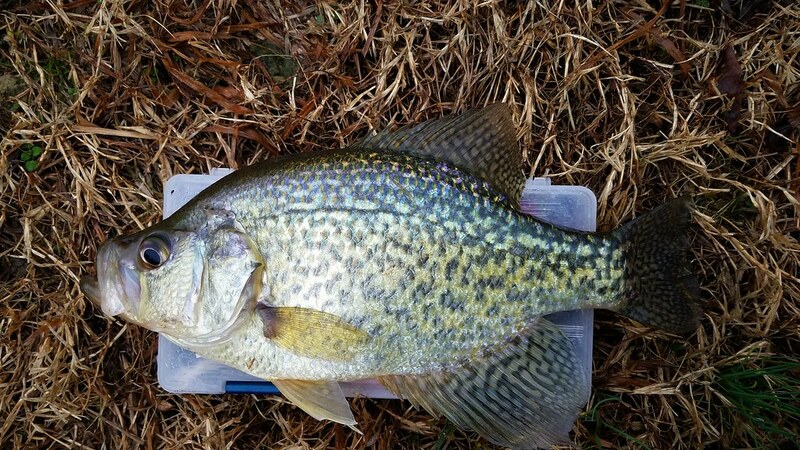 I started in the spring like I usually do, with a lot of crappie fishing. 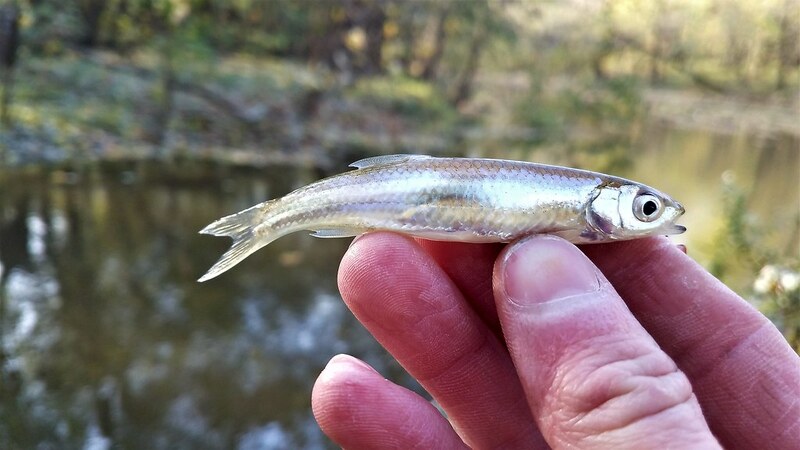 I’m usually more of a catch-and-release fisherman, but this year I actually harvested some my catches. One of my best trips was on a perfect, cold, rainy day. 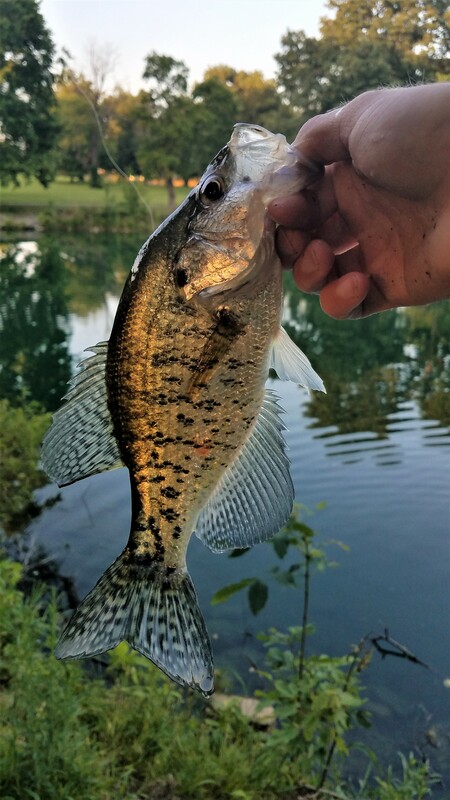 The crappie bite was crazy- it seemed like on every cast I would hook into a quality Black Crappie. 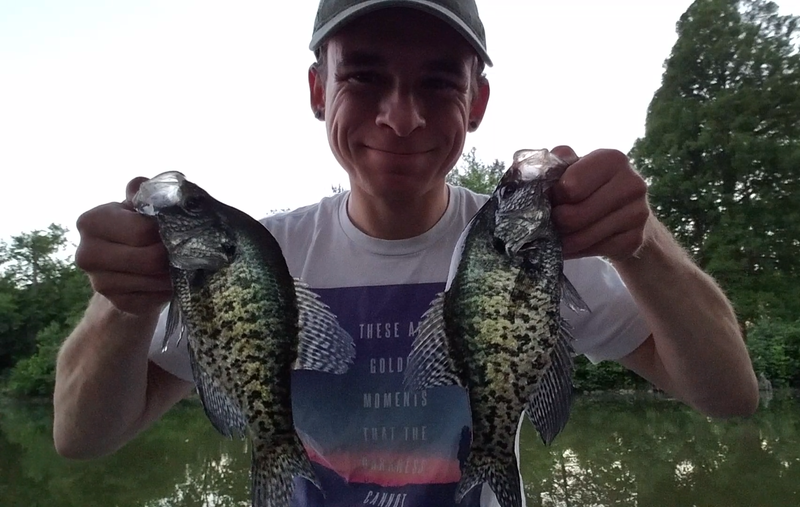 Indiana has a really large crappie limit, so I chose not to take a full limit, but I caught enough for a few meals. 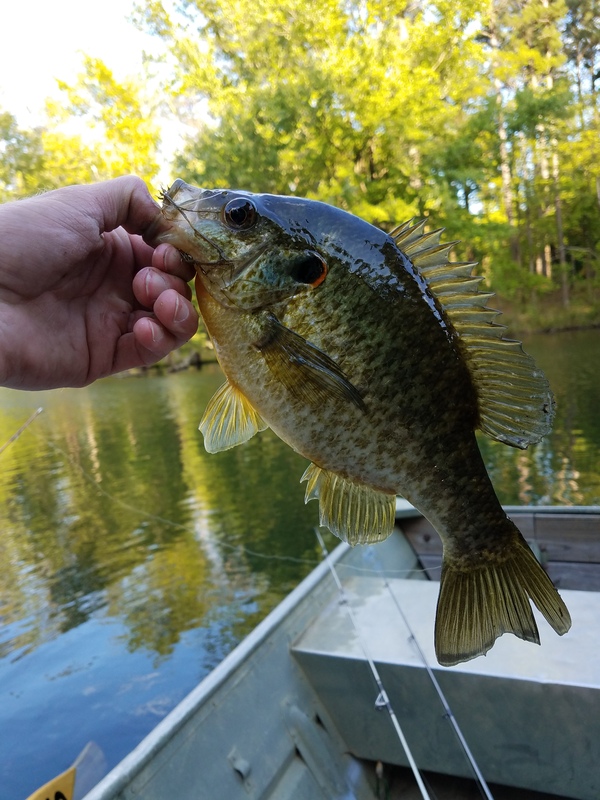 The best White Crappie I caught this year was (oddly enough) while I was doing some bass fishing. 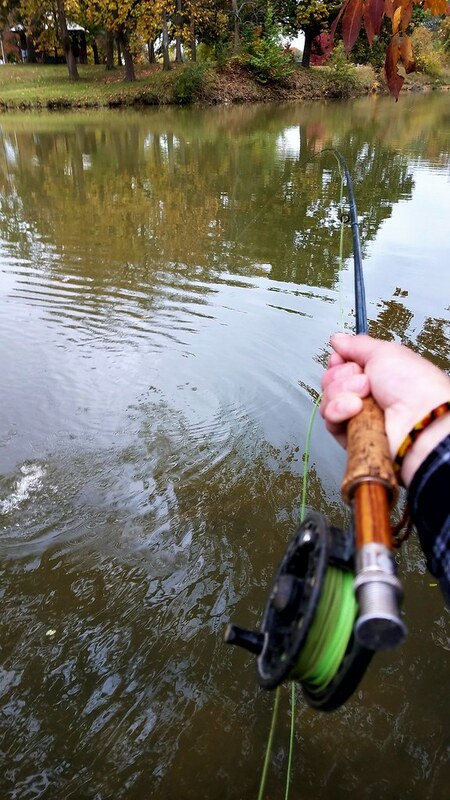 I launched my little, inflatable kayak into a beaver pond in hopes of some big bass. 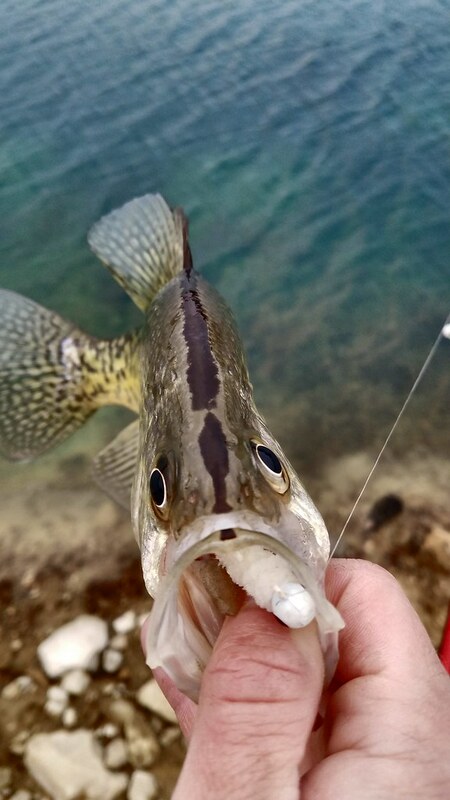 Strangely, instead of the bass I was hoping for, I actually hooked into my biggest White Crappie of the year. 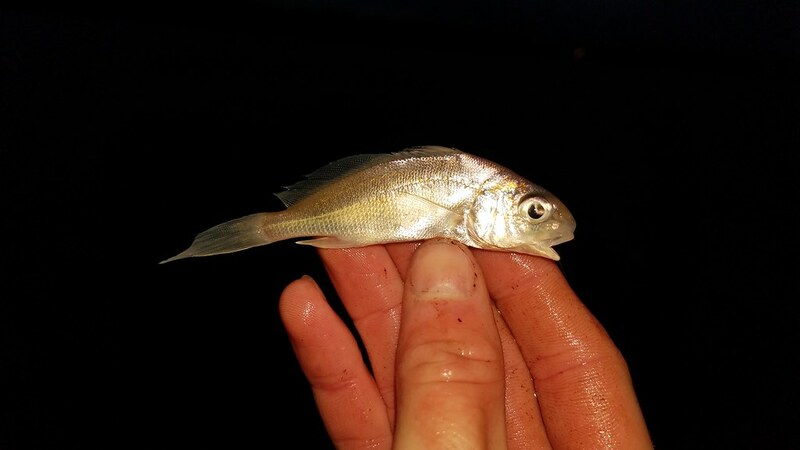 I also spent a lot of time this year trying to break my personal best for Warmouth. 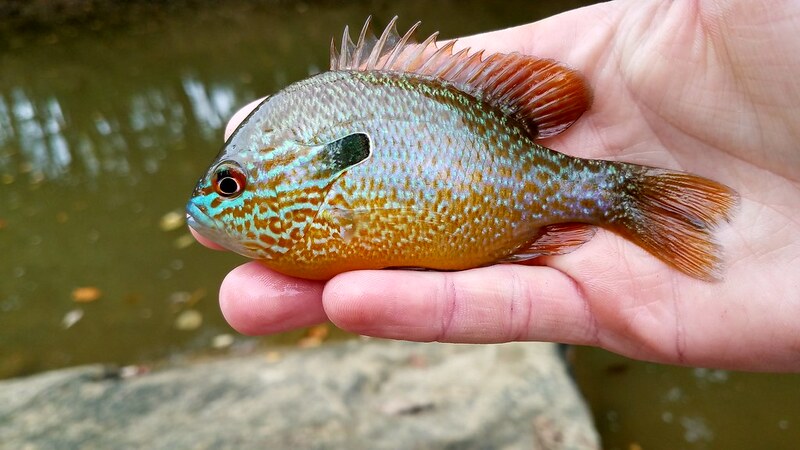 I know this isn’t typically a fish people care much for, but I think they are one of the most underrated panfish out there. 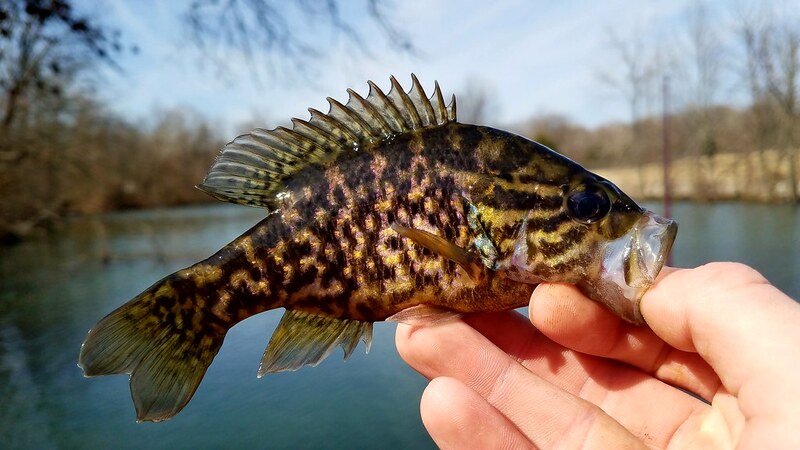 My hunt this year was very successful: I landed some of the biggest Warmouth I have ever seen in Indiana. 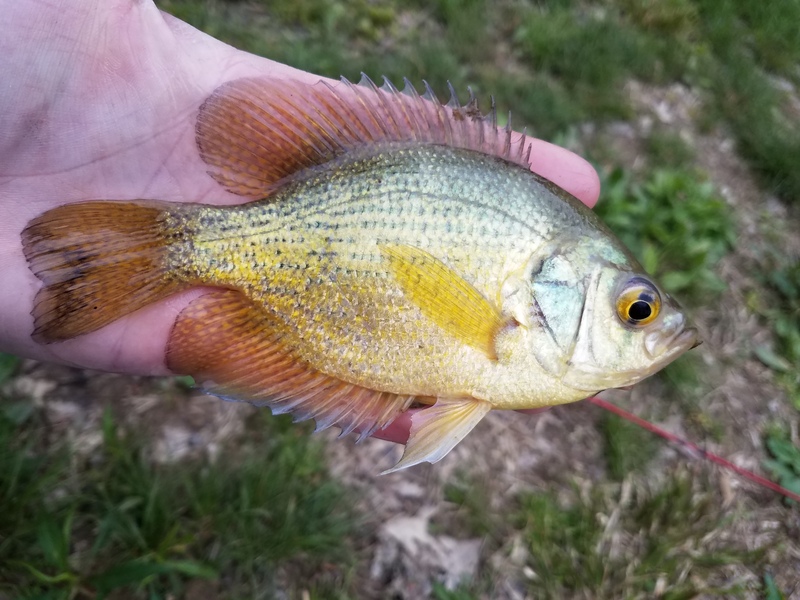 None of my fish were record fish for my state, but as far as I was concerned, they were trophy fish. 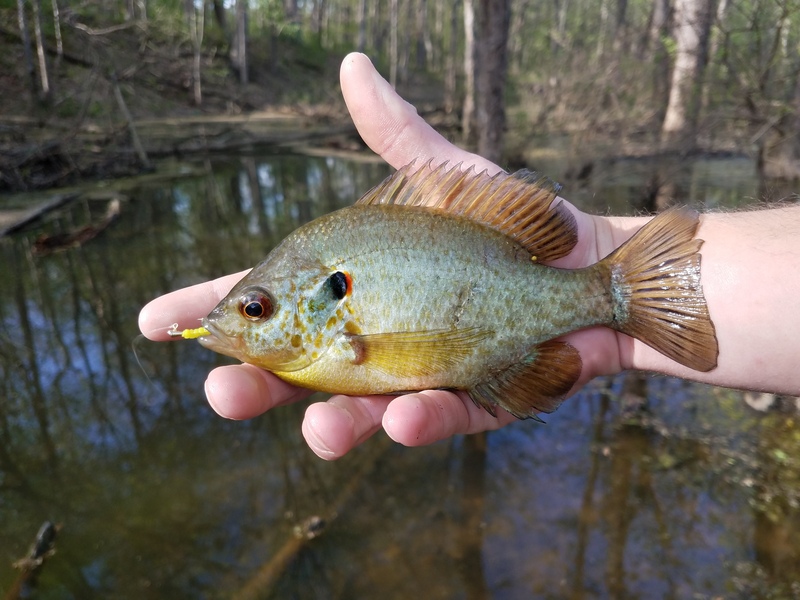 One of my favorite catches this year was a Flier Sunfish. 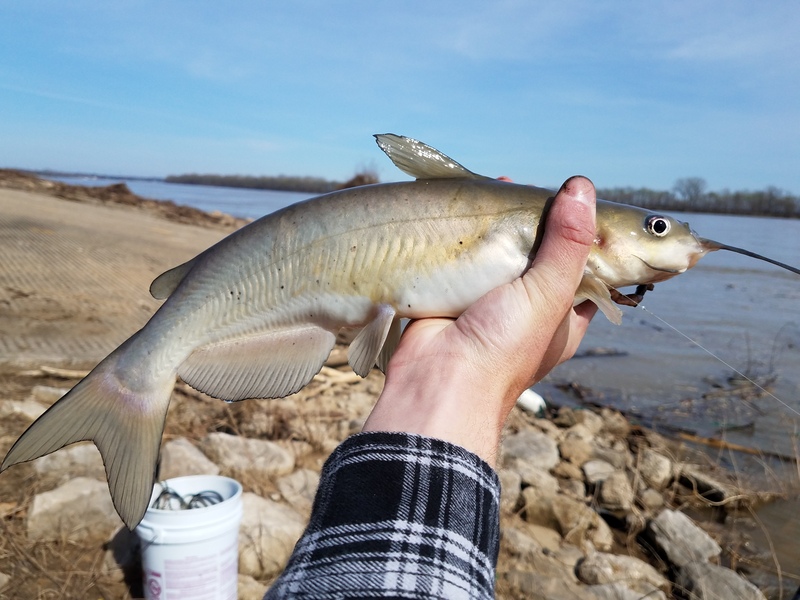 I tend to catch a couple of these each year in the Ohio River flood plains, but this year I wanted to catch my first one on an artificial lure. And I actually succeeded! 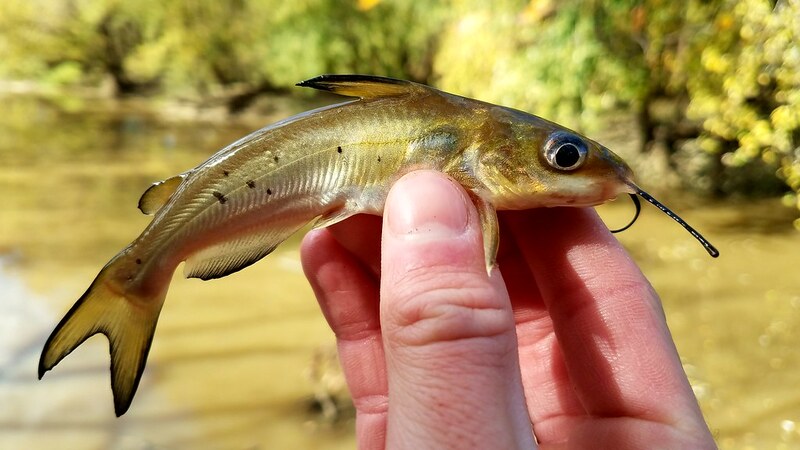 I also discovered after releasing this fish that Indiana’s record Flier is only 3.5 oz, so I think next year I am going to try to break this. 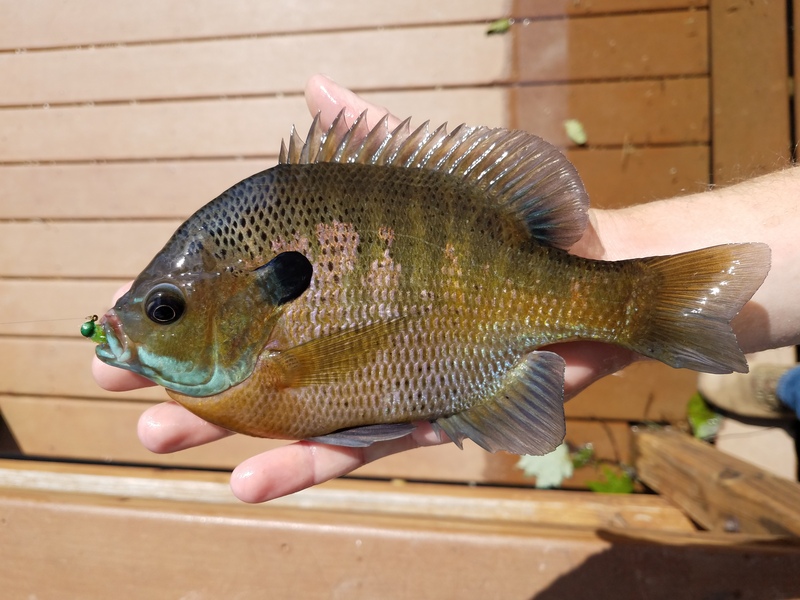 I caught the usual Bluegill, Longear, and Redear Sunfish throughout the summer. 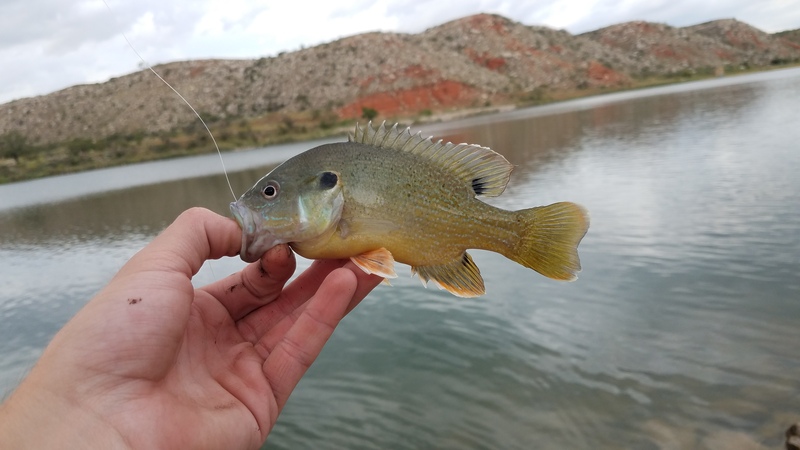 They stayed shallow for most of the year, so my 5 weight fly rod was the weapon of choice to target most of these fish. 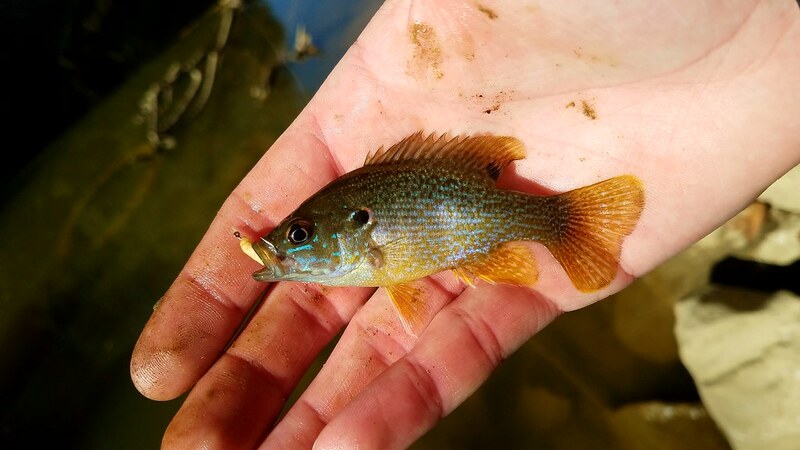 The prize fish I caught this year was my first ever Redspotted Sunfish! 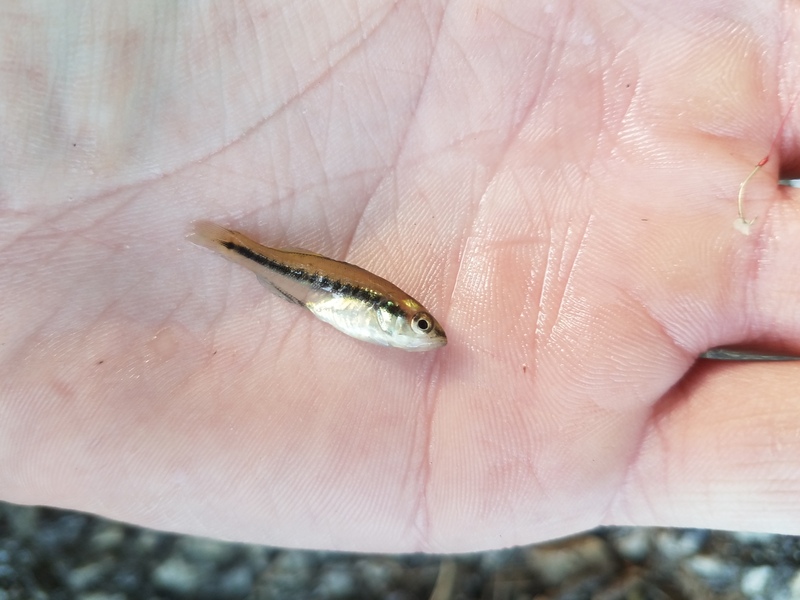 I know they are common in most areas, but I am right at the edge of their native range, so they really aren’t a common catch for me. 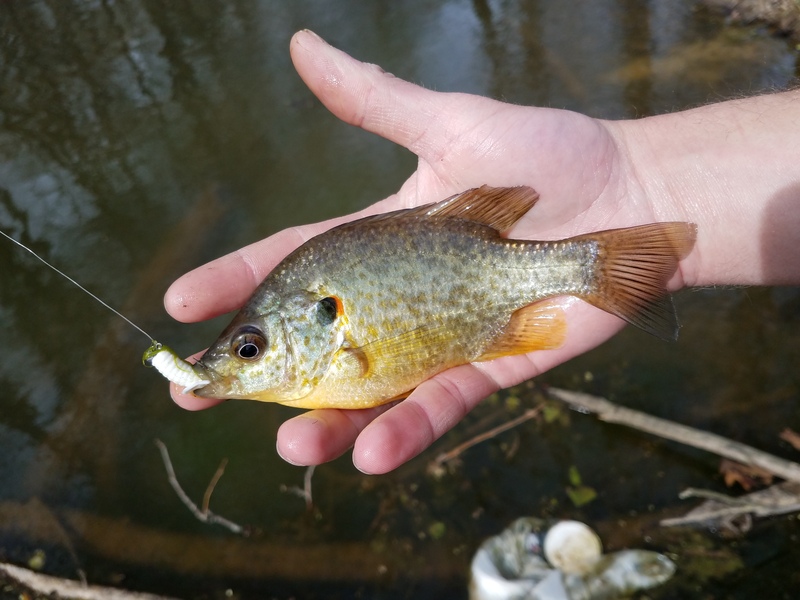 The best part was that I caught it on one of my homemade jigs. 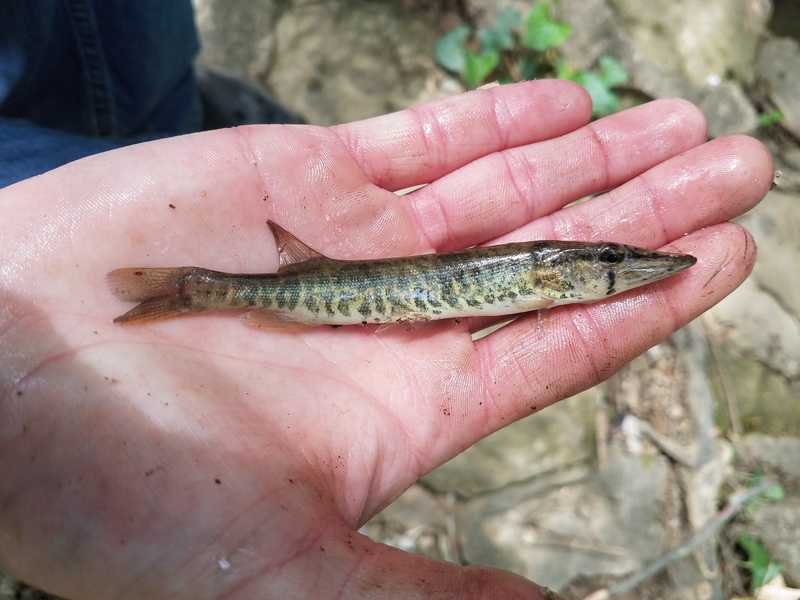 As you’d expect, I also spent a lot of time fishing the Ohio River. 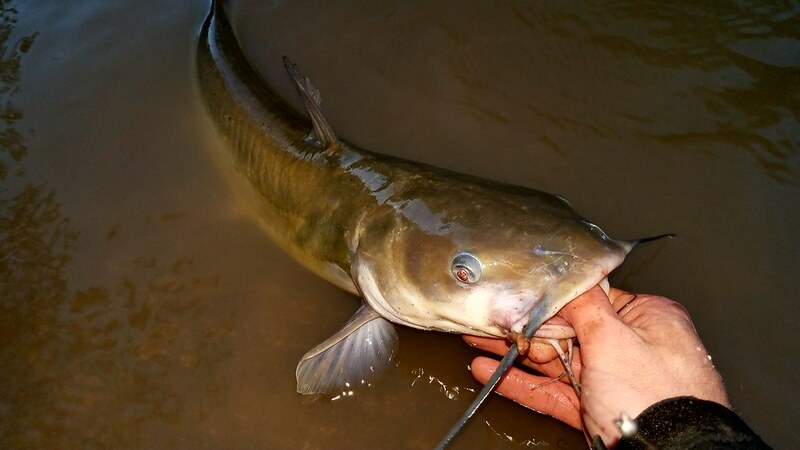 This was probably my worst year for catfish because I spent more time fishing lures than cut-bait in the river. 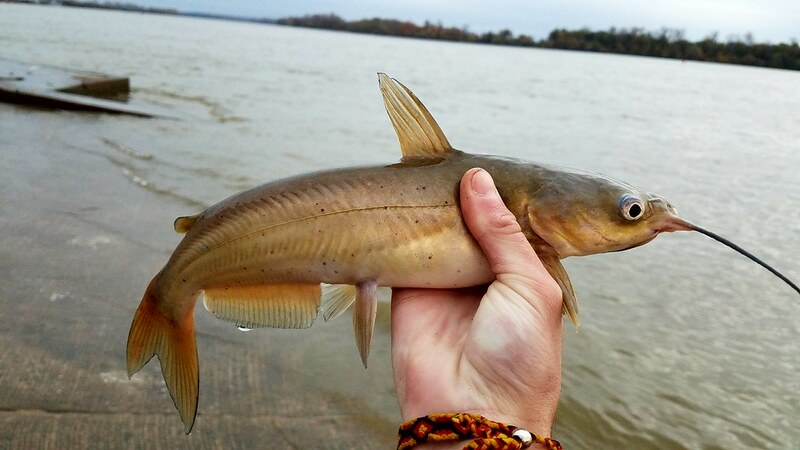 But I did manage to catch the three main catfish species from the Ohio River. 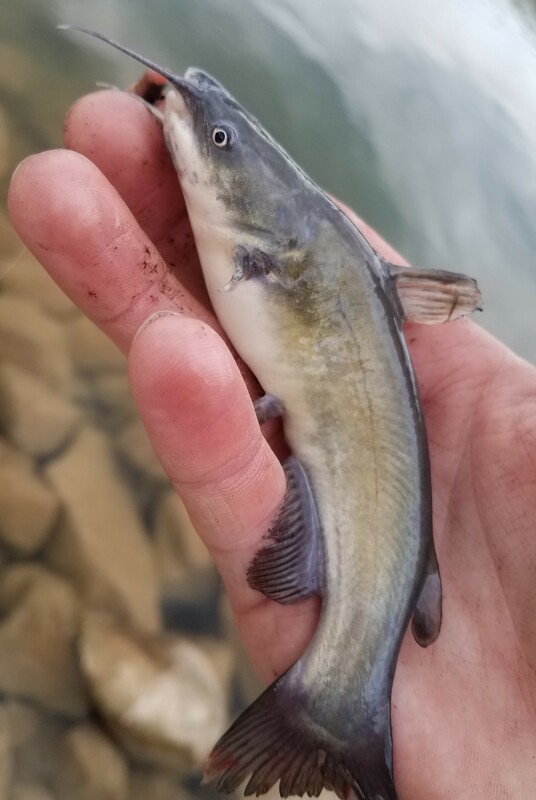 The biggest catfish I caught this year was this Blue Catfish during the spring flooding, but I also caught the odd Flathead Catfish and a lot of little Channel Catfish. 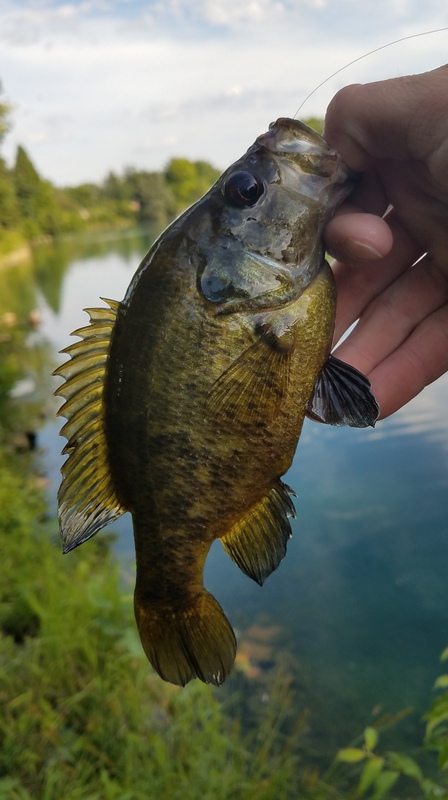 I seem to catch one Smallmouth Buffalo a year, and this year I actually had a decent camera with me so that you all could see it. 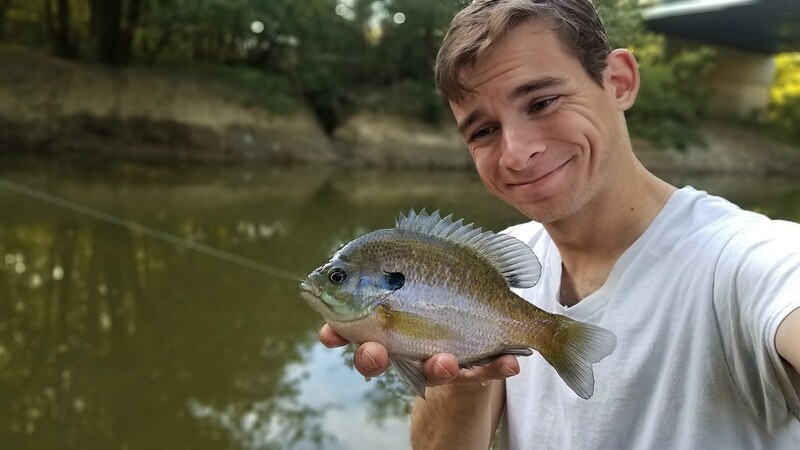 These are always one of my favorite fish to catch, and one of these days I’m going to figure out how to catch them regularly. 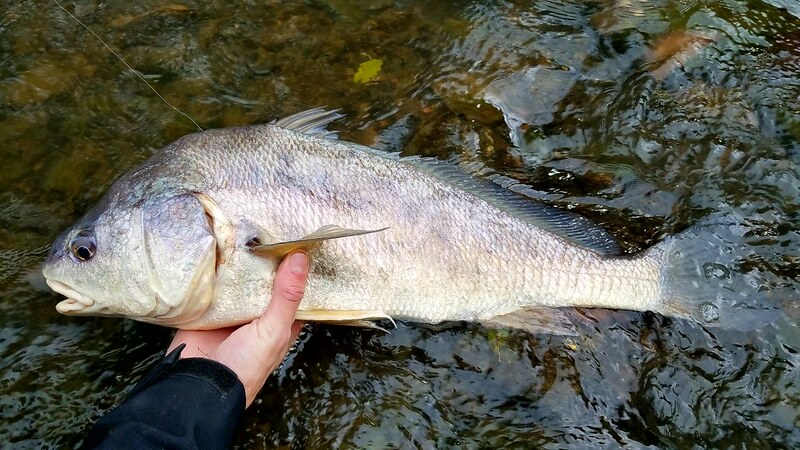 And if you’ve ever fished the Ohio River, you know there is never any shortage of Freshwater Drum there. 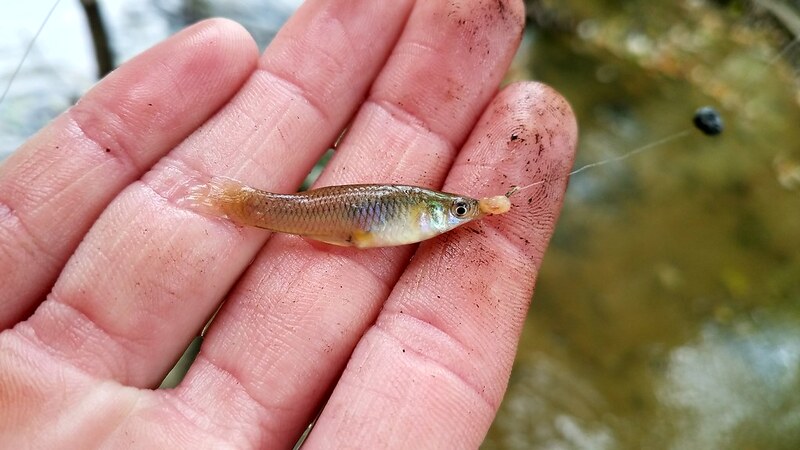 And I caught a LOT of them this year! 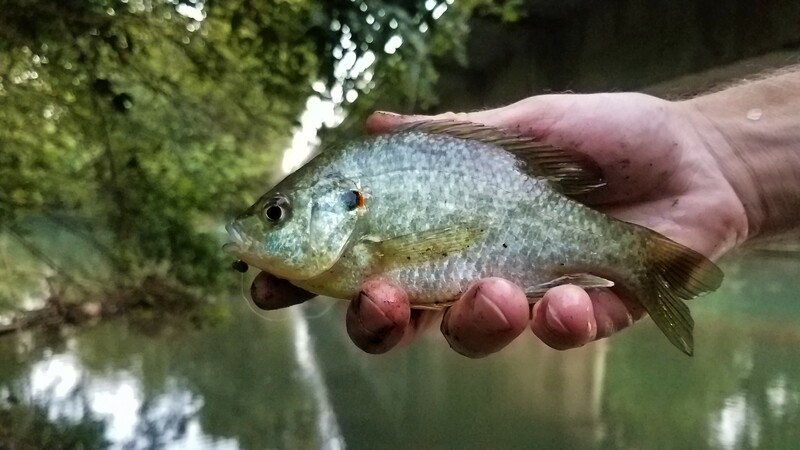 None of them were particularly big, but they always break the silence on slow fishing days. 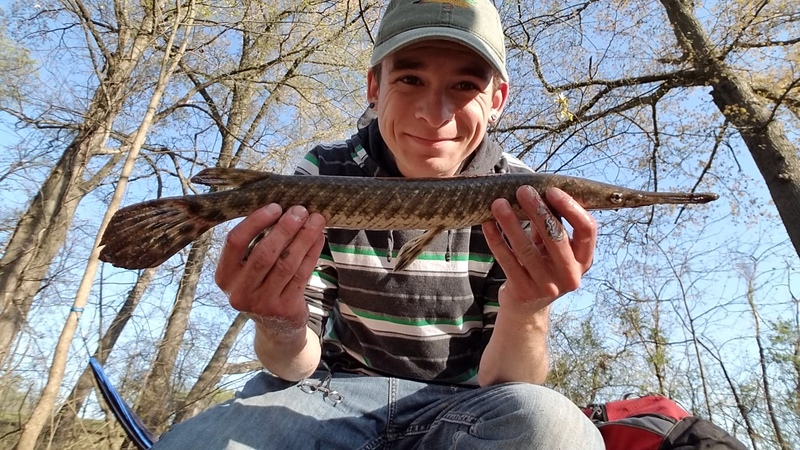 On one of my rare night-fishing trips, I broke my personal best for Longnose Gar. 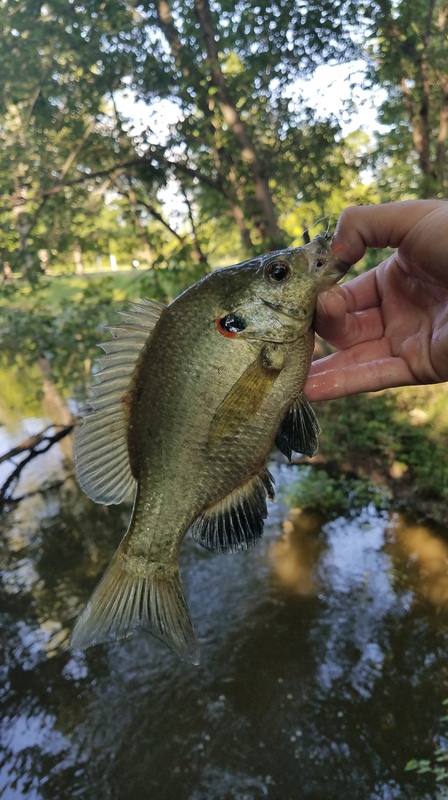 I got very lucky with this fish because I don’t tend to fish with steel leaders. 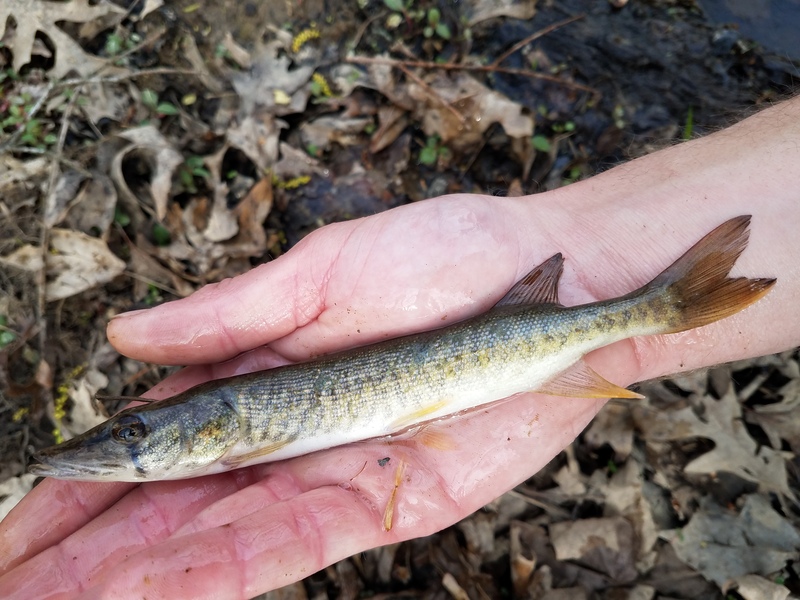 Every year, there seems to be about a two-week window where the river conditions are right to catch Sauger from the bank. And this year, I actually managed to guess the right day to find where they were schooled up. 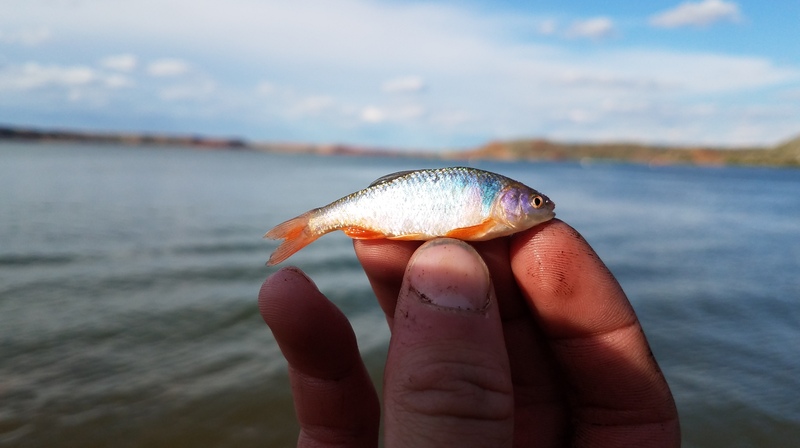 Still no big fish, but this was the first year I was able to capture a high-quality picture of these gorgeous fish. 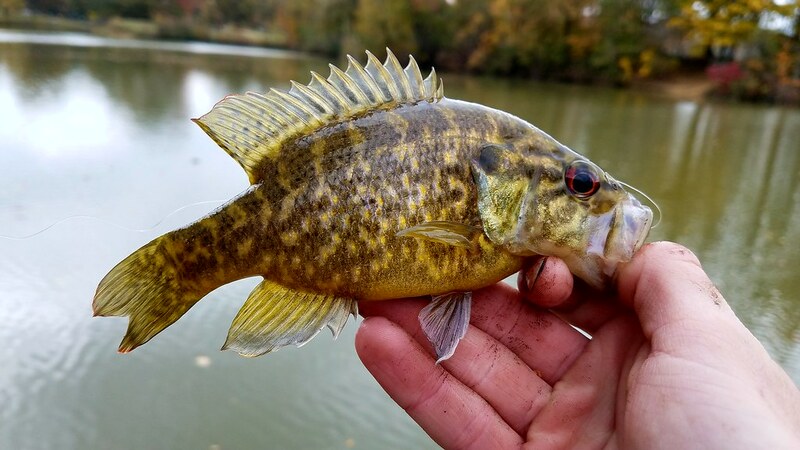 I even managed a rare Ohio River Smallmouth Bass this year (well, rare for how south I am). 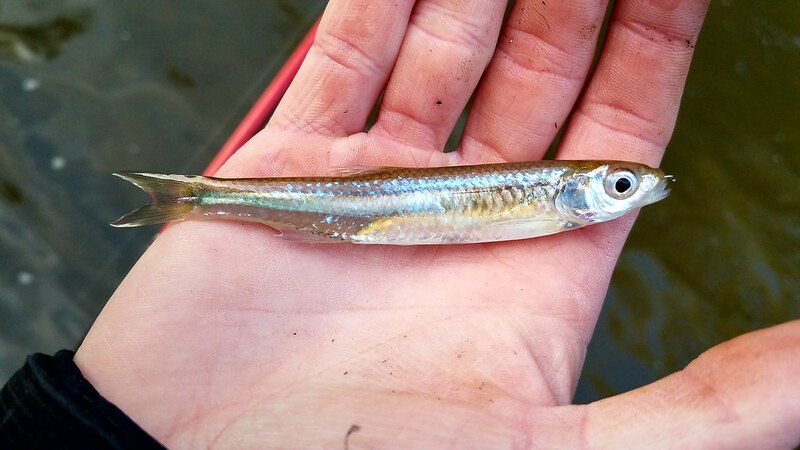 I’ve caught a whopping 3 of these out of this river for as long as I have fished it. 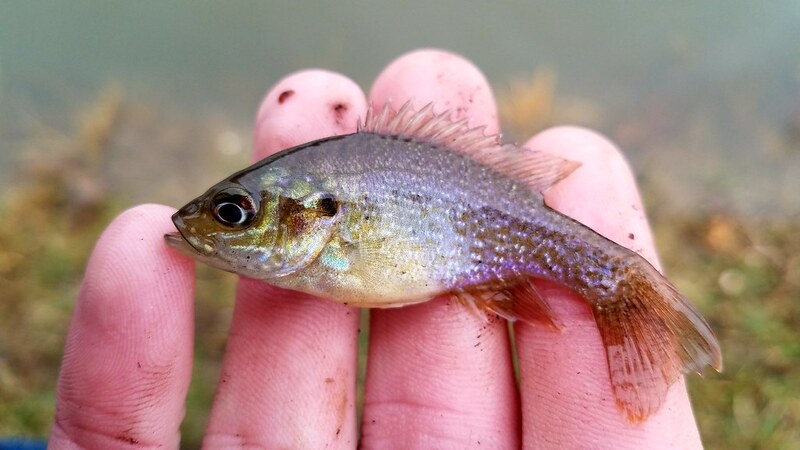 This one was easily the smallest one I’ve ever caught, but it was also one of the prettiest. 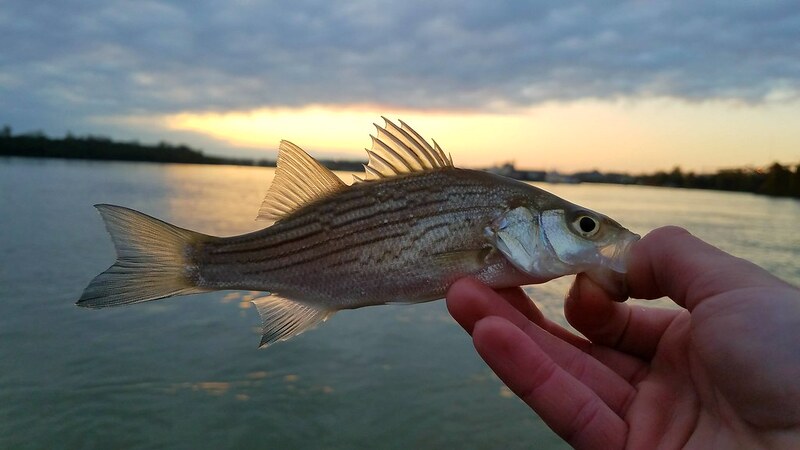 The summer brought the usual run of Striped Bass and Hybrid Striped Bass. 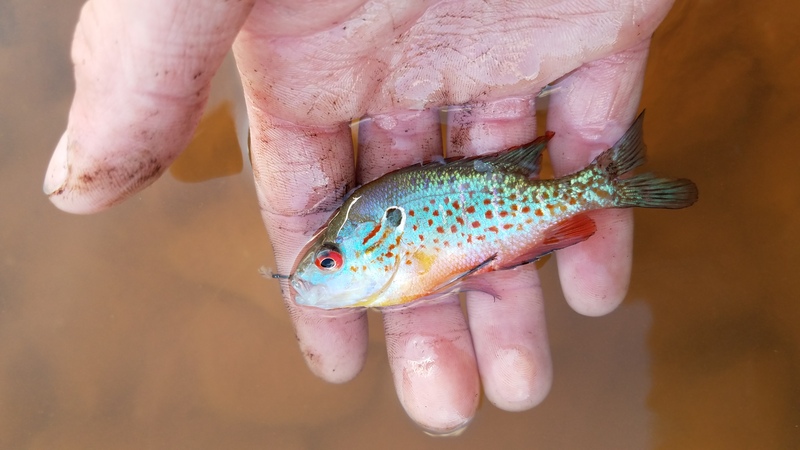 I tried my hardest to catch one of these fish on my fly rod, but that just wasn’t in the cards this year. 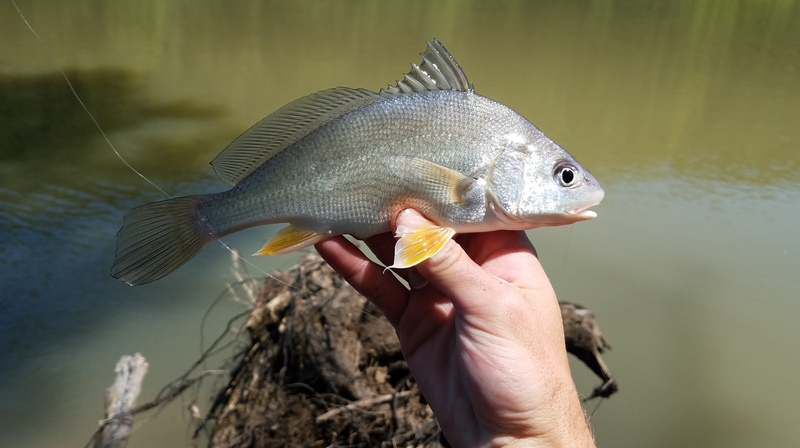 But I did catch more of these fish than I could keep track of on my spinning rod. 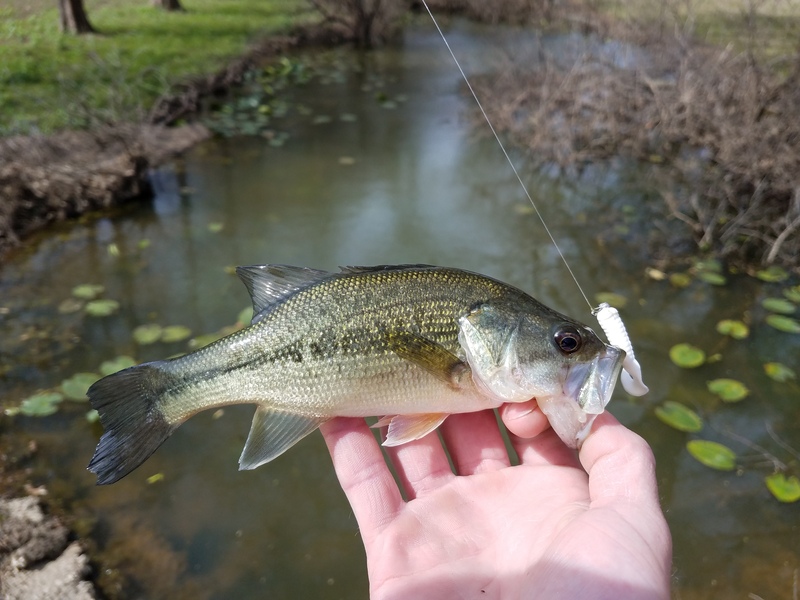 I rarely target Spotted Bass because I don’t have many good access sites where they are common. 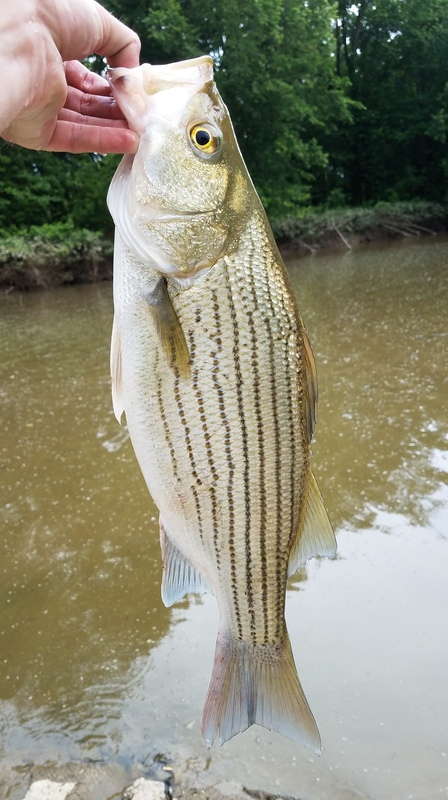 But there is one rock wall by a public boat launch that tends to hold one or two Spotted Bass, so I went out with my ultralight rod on a mission to catch one. 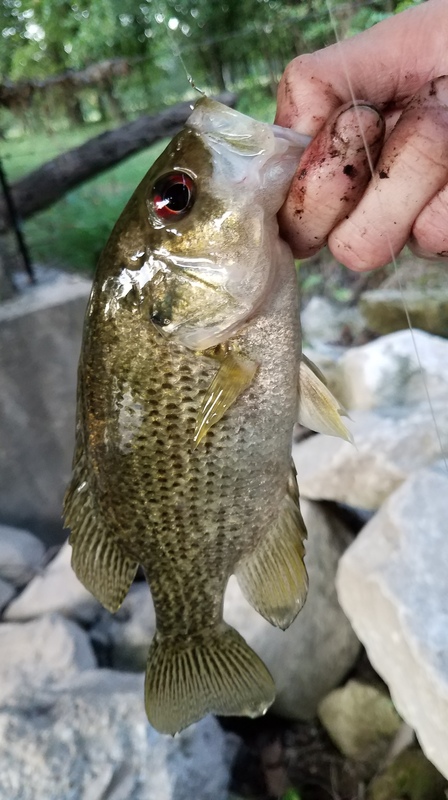 Oddly enough, I hooked into one on my very first cast at this spot (after this fish, I couldn’t seem to find another Spotted Bass for the life of me). 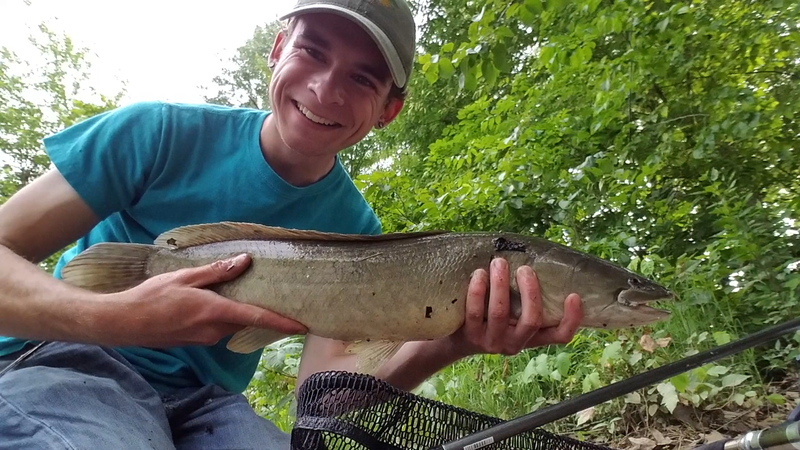 I spent less time in the Ohio River flood plains due to the heavy course load I took this semester, but I did manage one adventure back into some of flooded areas and hooked my only Bowfin for this year. I’m proud to report that this year I even manage to not get injured while handling it (last year one of these put a hook right through my hand). 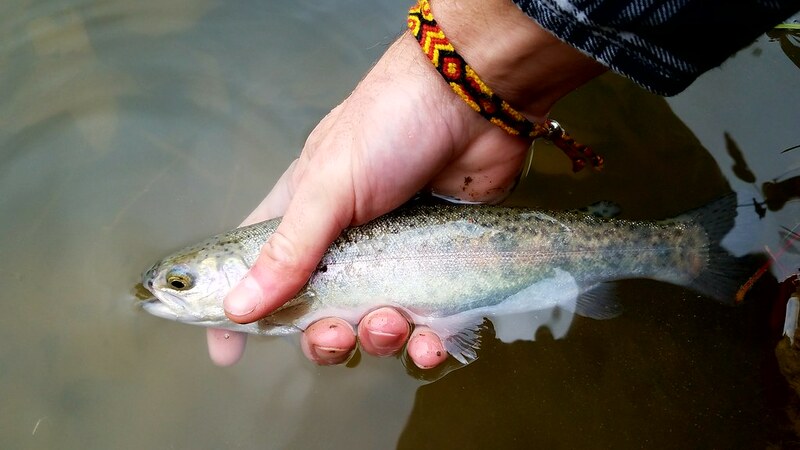 This year, I even hooked into a few Rainbow Trout! 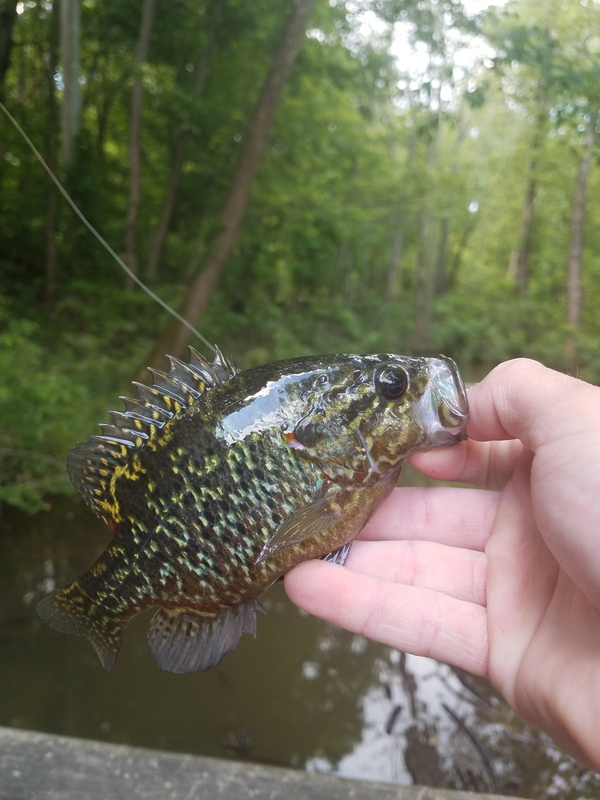 It’s been years since I have been lucky enough to even see one of these fish, so to actually be able to fish for them was enough to make my year. 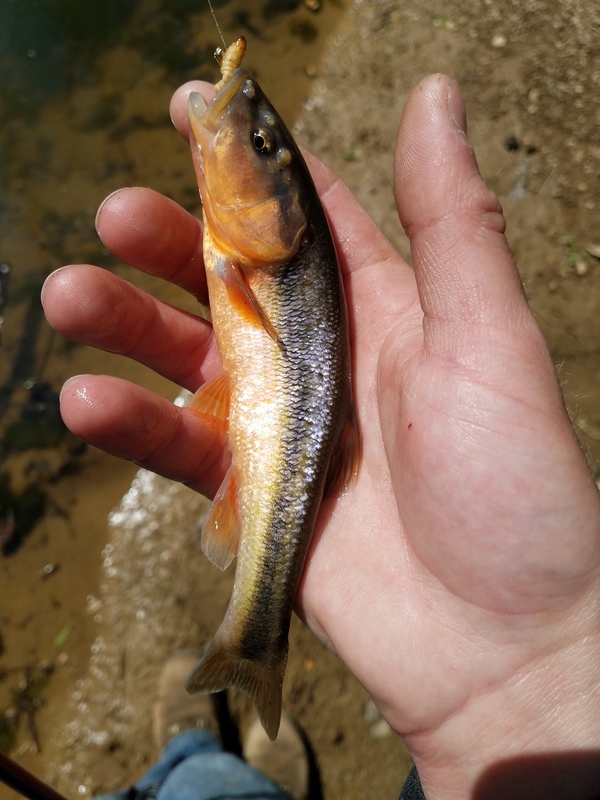 To make it even better, I even caught my first trout on my fly rod! 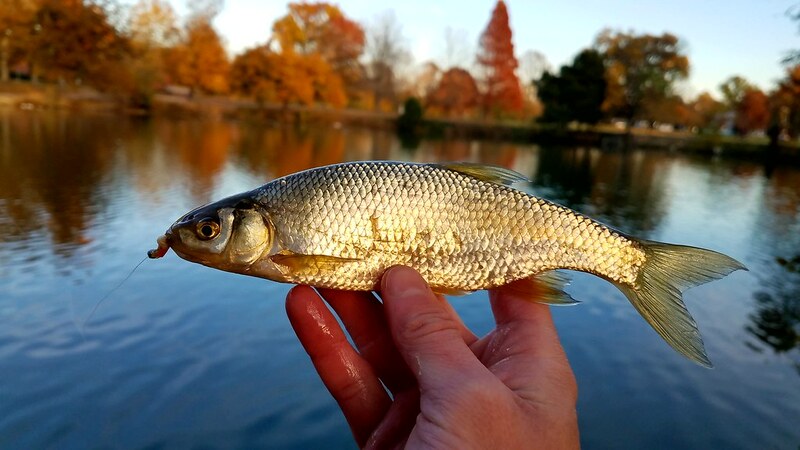 One of the most surprising catches I had this year was a Koi from a local park pond. 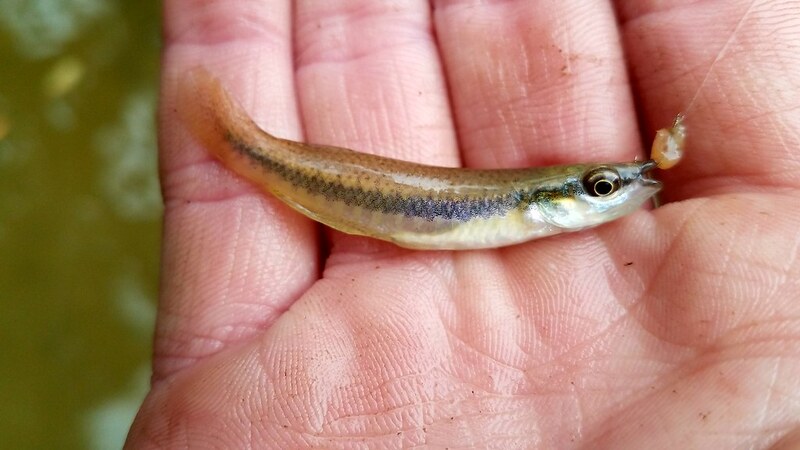 I was hoping to catch a little Common Carp, but this fish was far more exciting than my target. 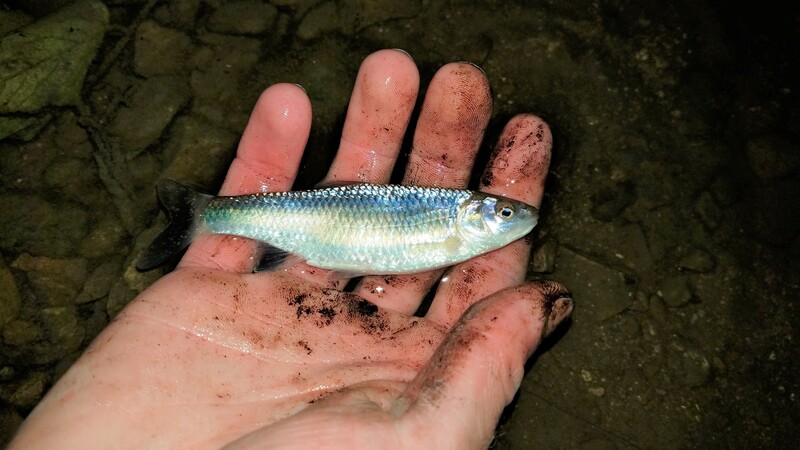 While exploring a little drainage ditch for Creek Chubs, I caught my first Grass Carp ever (not the size I was expecting my first Grass Carp to be, but it was a Grass Carp none the less). 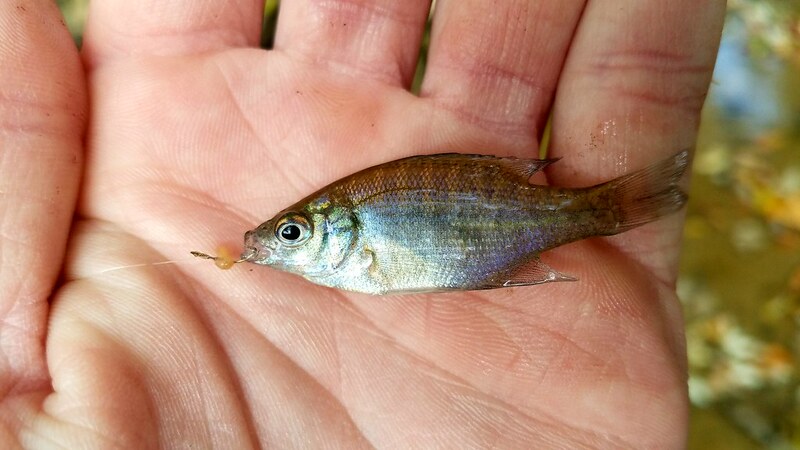 On a quick trip to Los Angeles, I added a good number of fish to my species list. 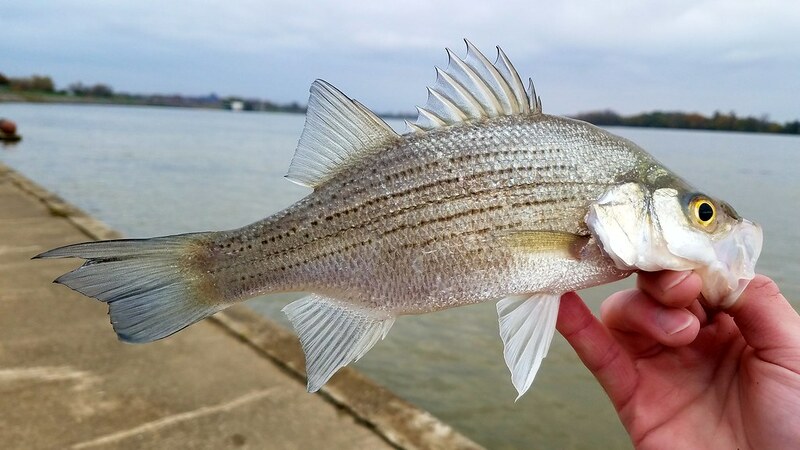 I fished from a few public piers and managed to catch some Barred Sand Bass, Kelp Bass, California Scorpionfish, California Lizardfish, Pacific Mackerel, and Queenfish. This was a fantastic year filled with some great trips with some phenomenal people. 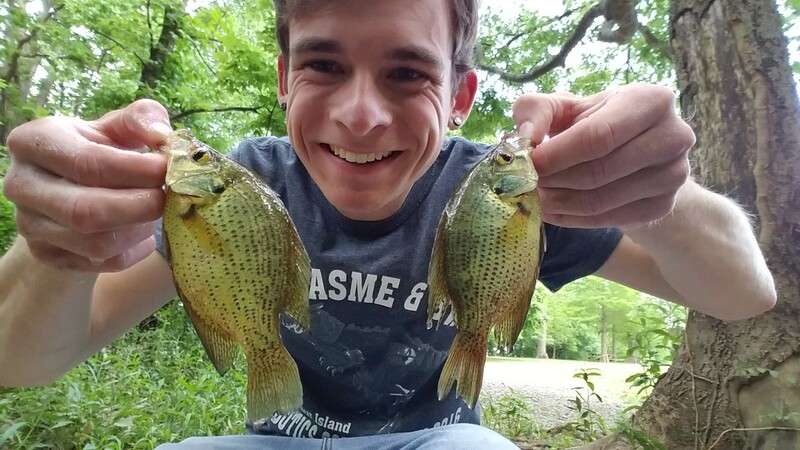 I hope that you were all able to spend some time out on the water with the people you care about and catch a few memorial fish. I hope 2017 is just as fishy as 2016!